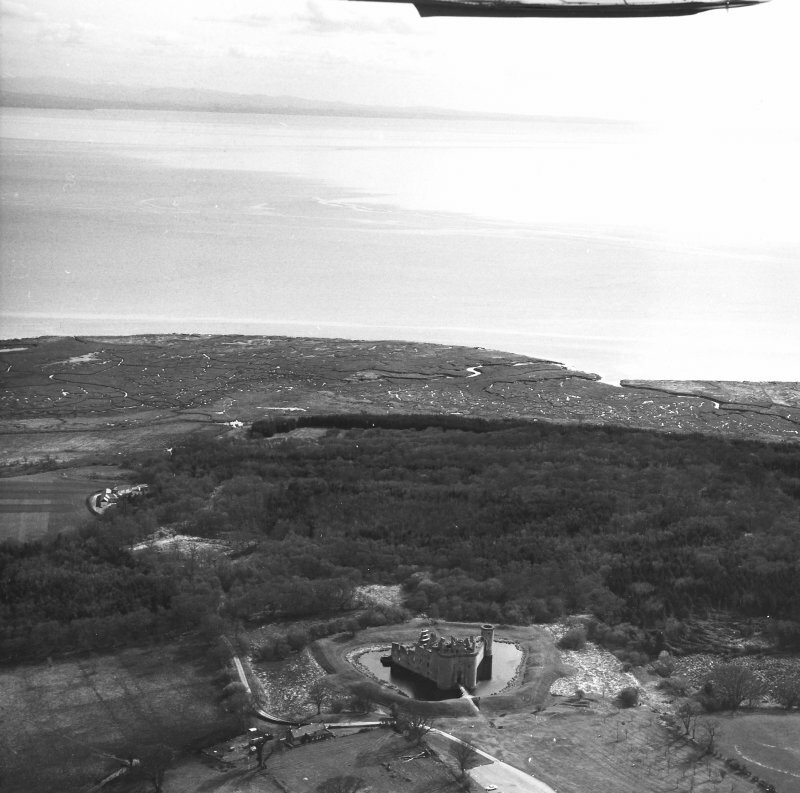 Oblique aerial view from SSE. View of gatehouse from North. 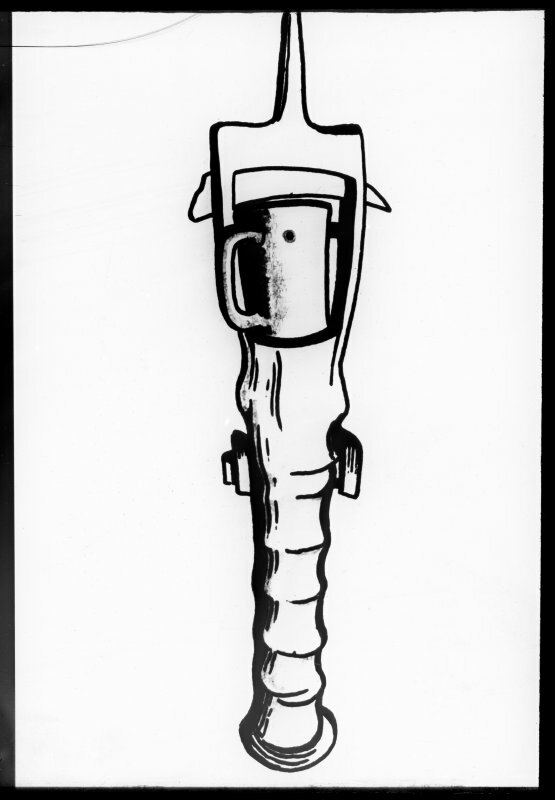 Photographic copy of drawing of excavation find. 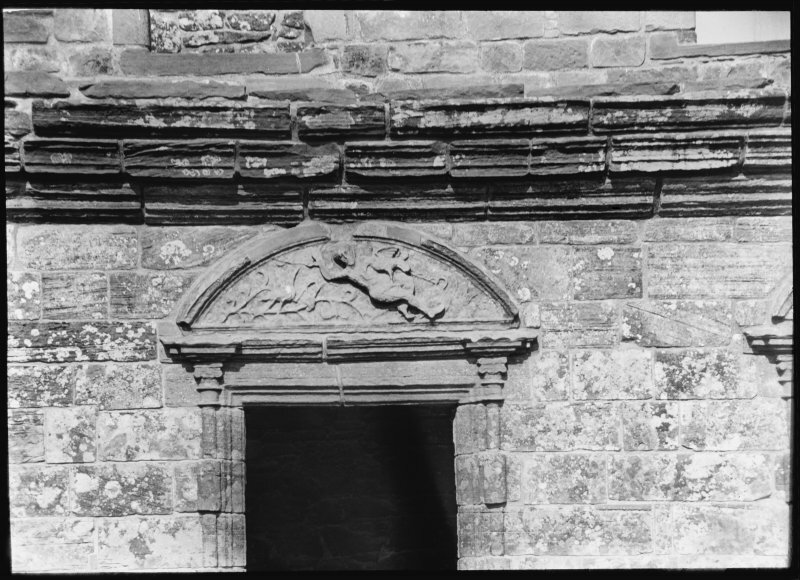 Details of carved tympana of window pediments on East elevation, first and second floors, Caerlaverock Castle. 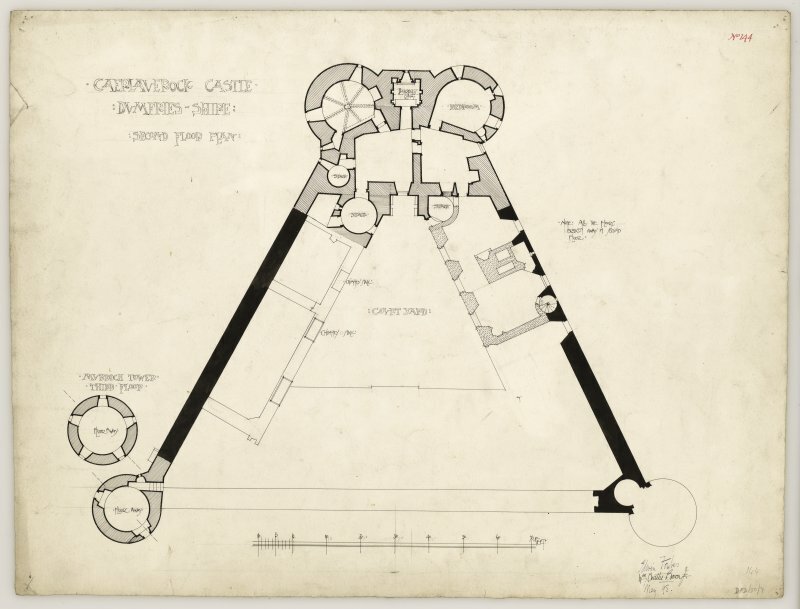 Plans and elevations of Caerlaverock Castle. 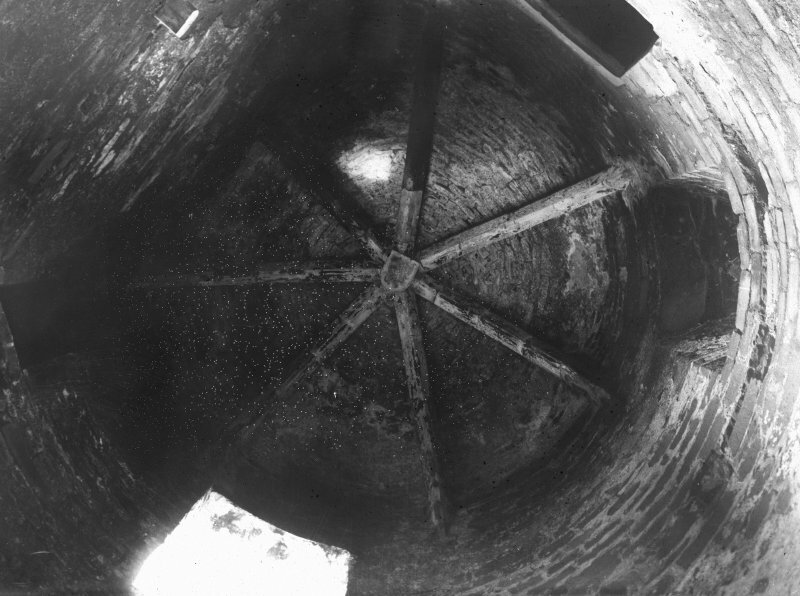 Caerlaverock Castle, interior showing view of vault. 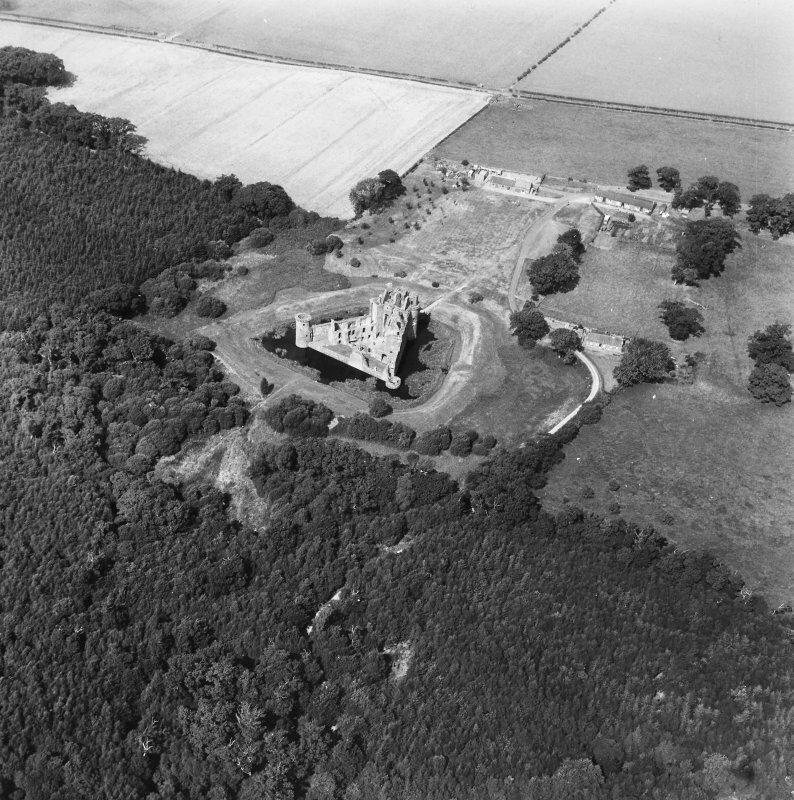 Oblique aerial view of Caerlaverock Castle, taken from the NNW. 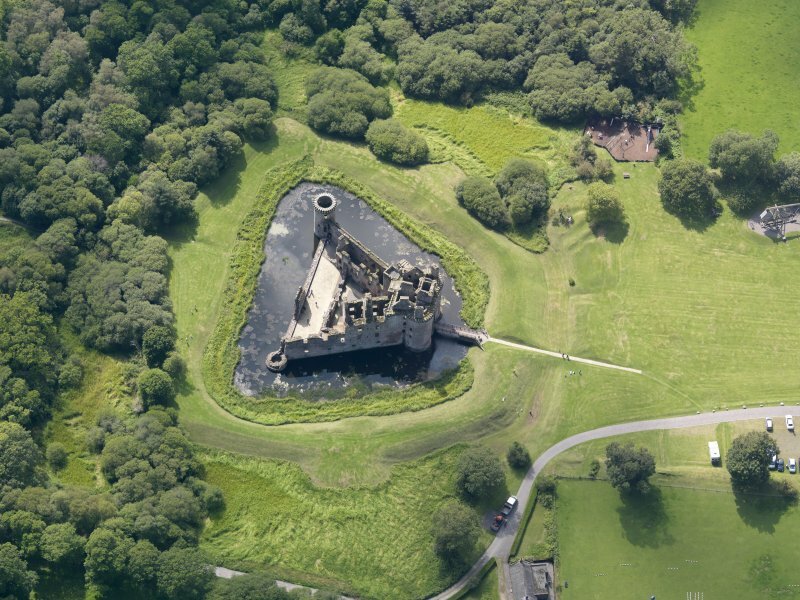 Oblique aerial view of Caerlaverock Castle, taken from the SSE. 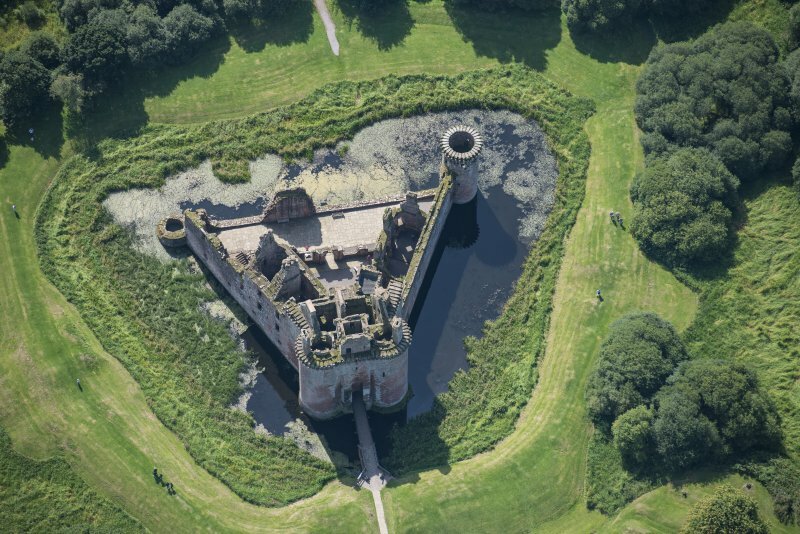 Caerlaverock Castle. View of East wall. 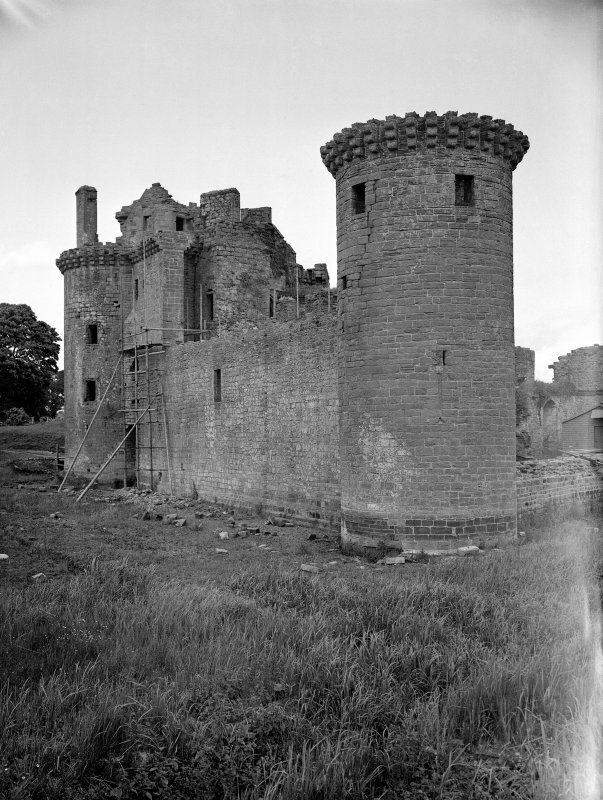 Caerlaverock Castle. View from South East. 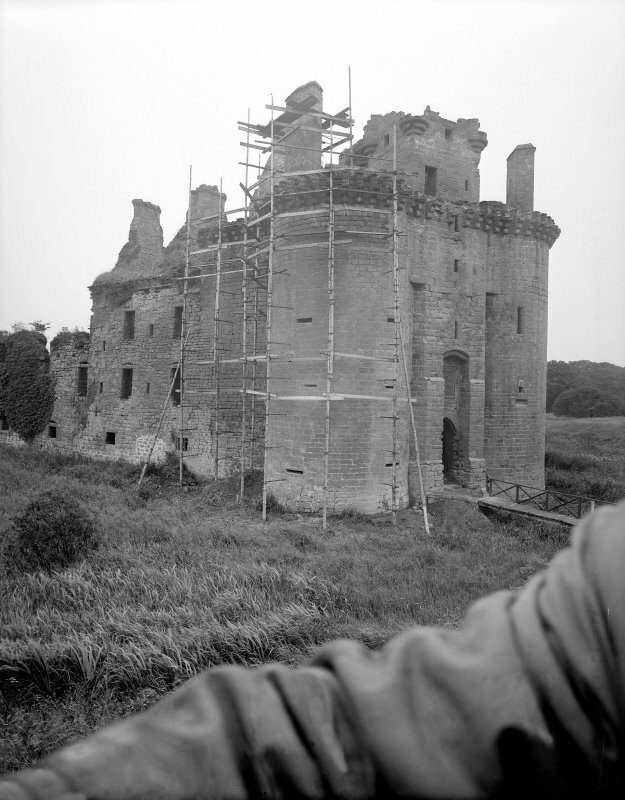 Caerlaverock Castle. View from South West. 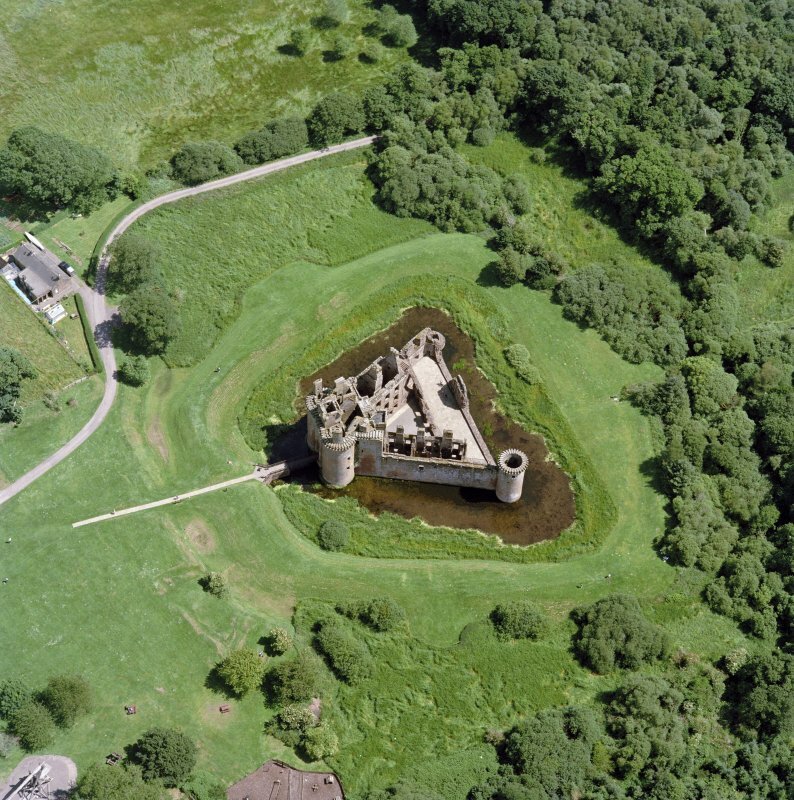 Caerlaverock Castle. 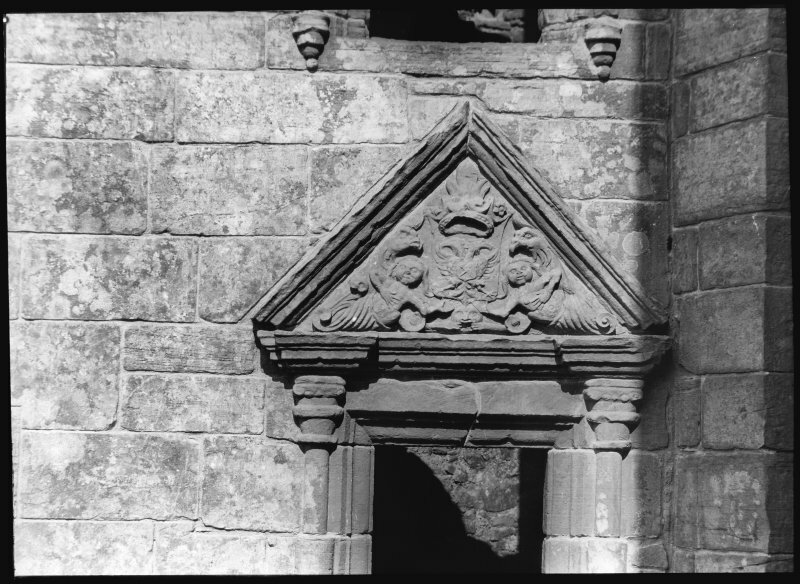 Detail of segmental pediment. Caerlaverock Castle. View of entrance from North. 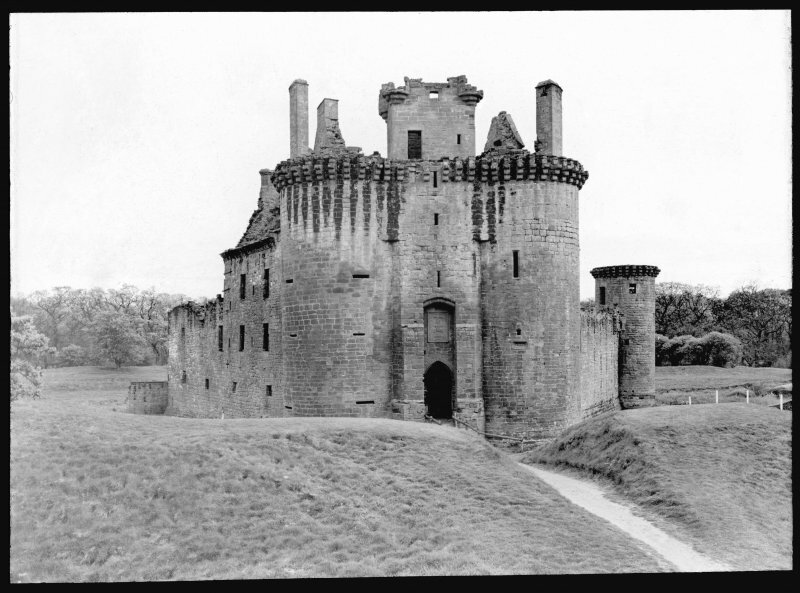 Caerlaverock Castle. View of datestone (1634) from Lord Nithsdale's East Range. 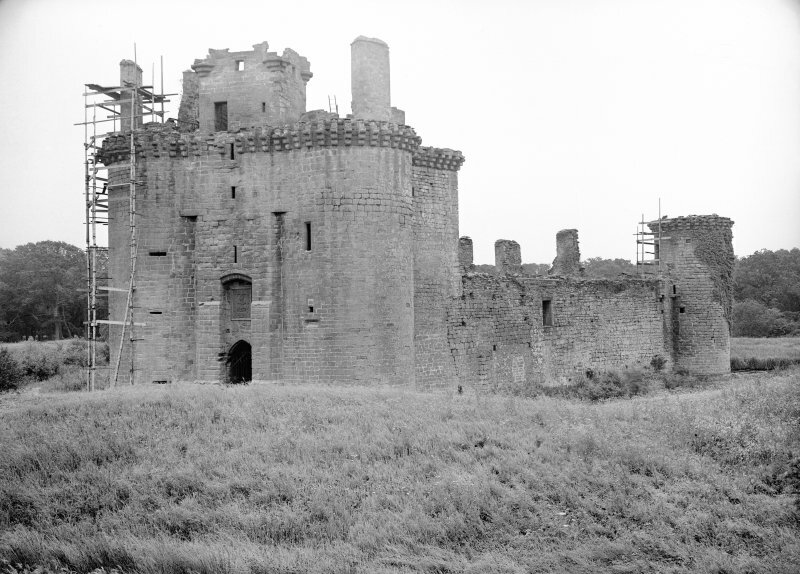 Caerlaverock Castle. View of gatehouse from North. View of North East angle of courtyard. 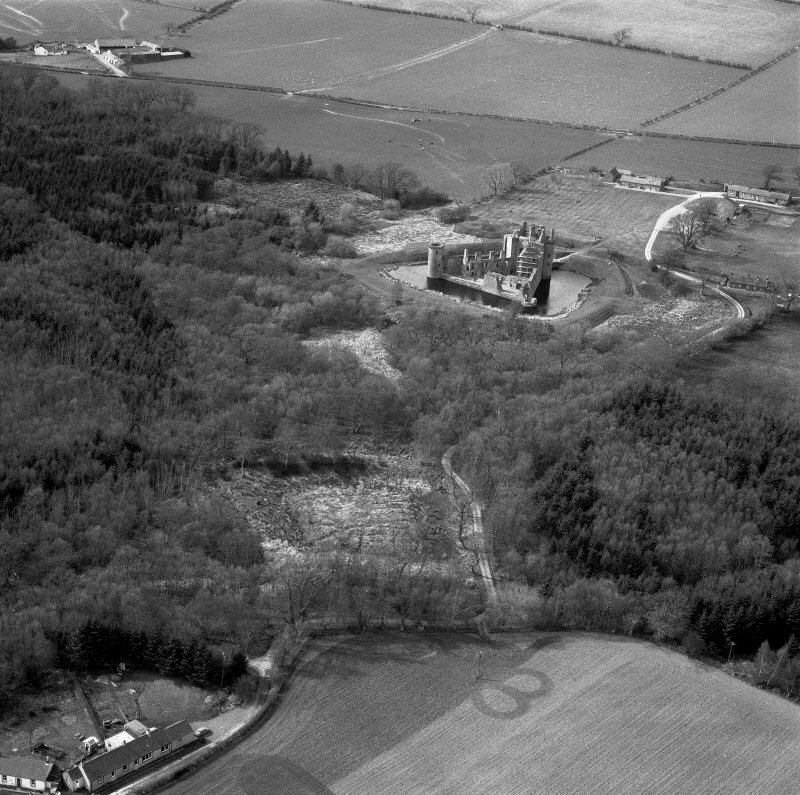 Oblique aerial view of Caerlaverock Castle centred on the castle, taken from the S.
Oblique aerial view centred on the remains of the castle and excavation of the old castle, taken from the W.
Oblique aerial view of Caerlaverock Caslte, taken from the SSE, centred on the castle. 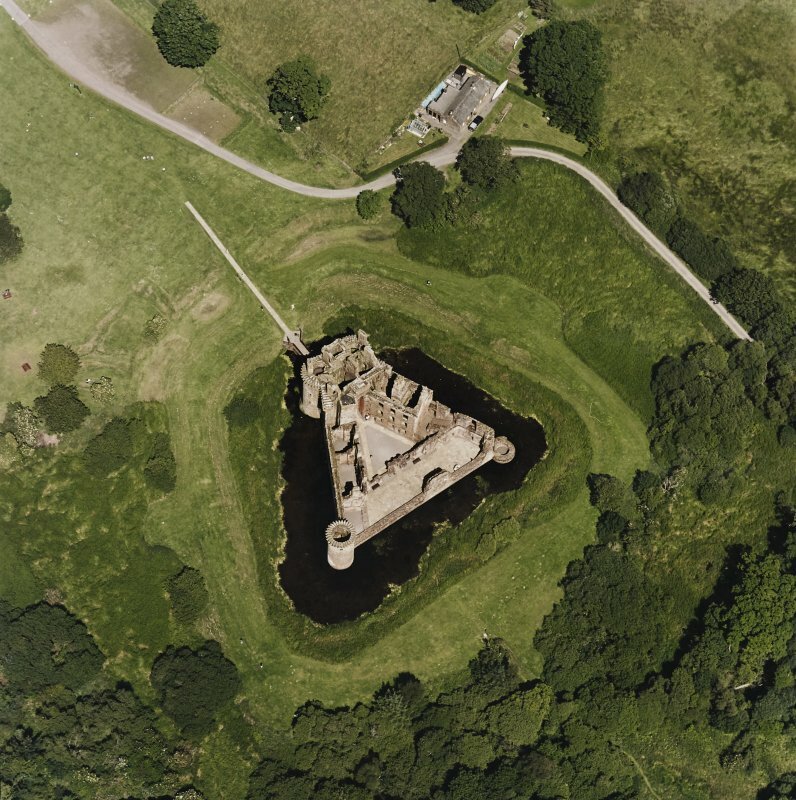 Oblique aerial view centred on the remains of Caerlaverock Castle, taken from the SSW. 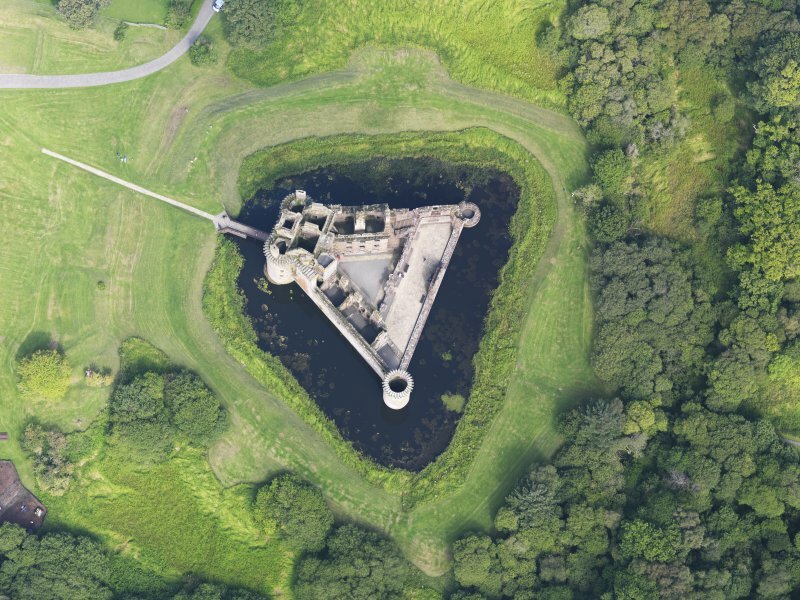 Oblique aerial view of Caerlaverock Castle. Excavation photograph: Excavation in progress during a visit from Andrew Walker, Architect for South Area and Angus Graham, Area Superintendant, Ian MacIvor is explaining the site. 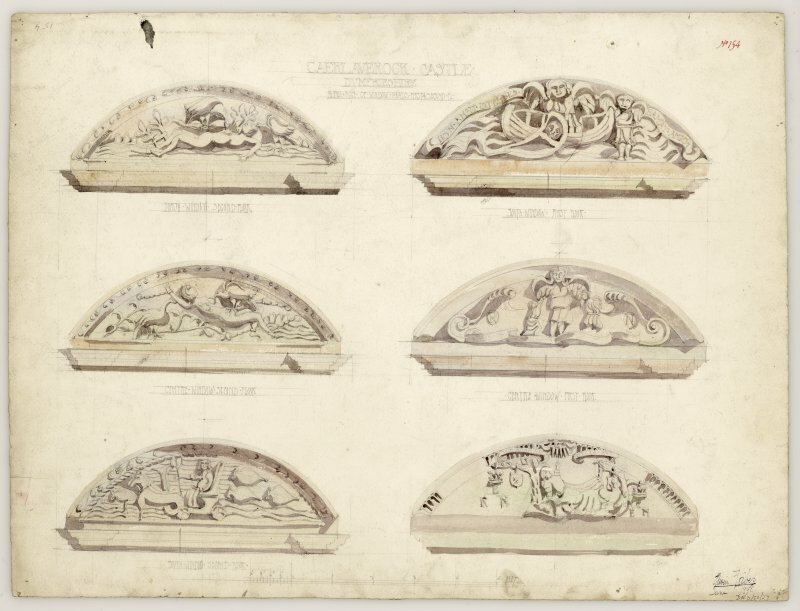 Detail of carved tympanum of window pediment. 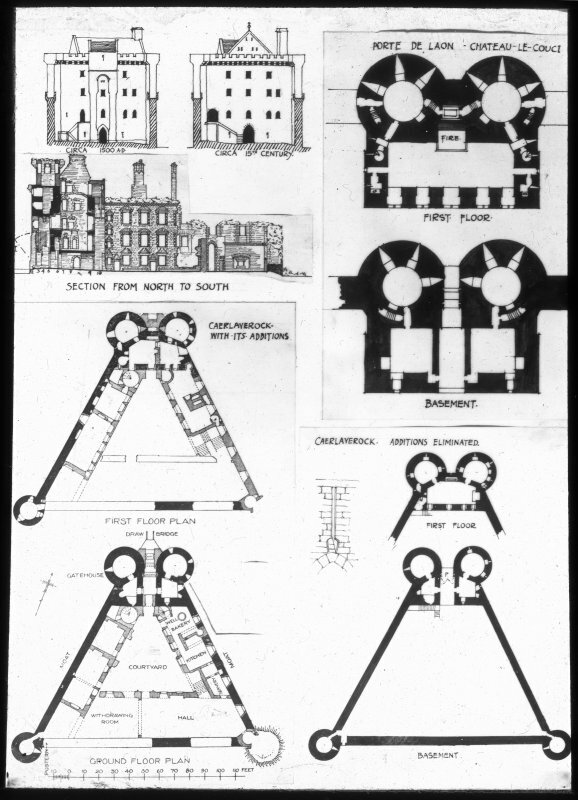 Photographic copy of plan of gatehouse. 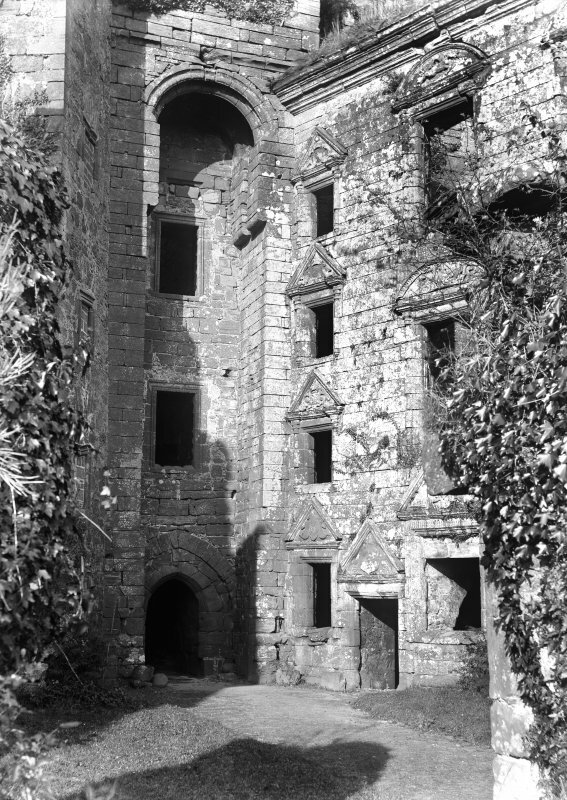 South elevation to courtyard and details of doorway and window, Caerlaverock Castle. 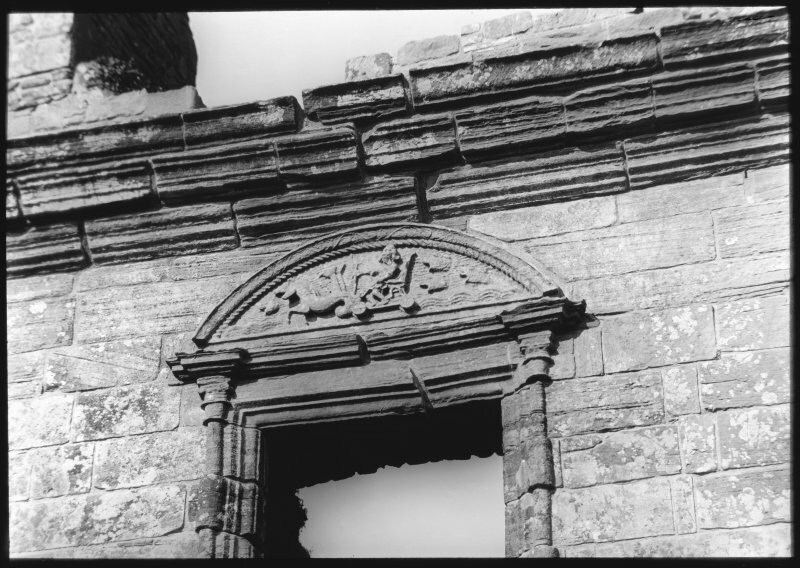 Details of heraldic devices and carved tympana of window pediments, Caerlaverock Castle. 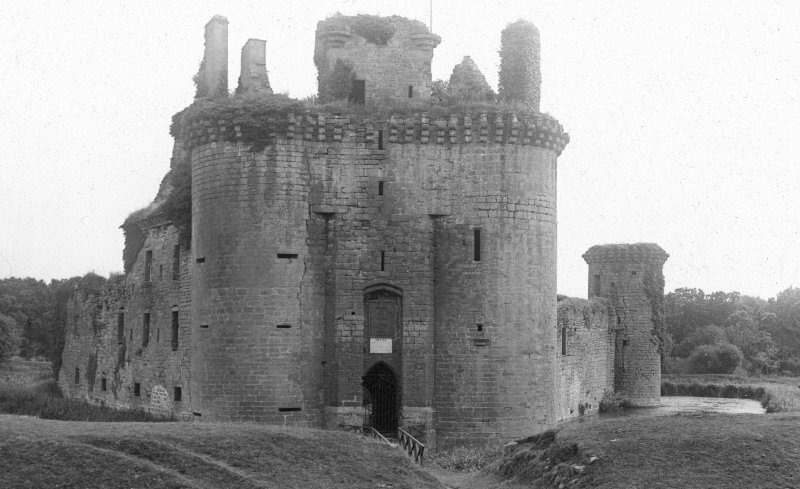 Caerlaverock Castle.View of entrance front. 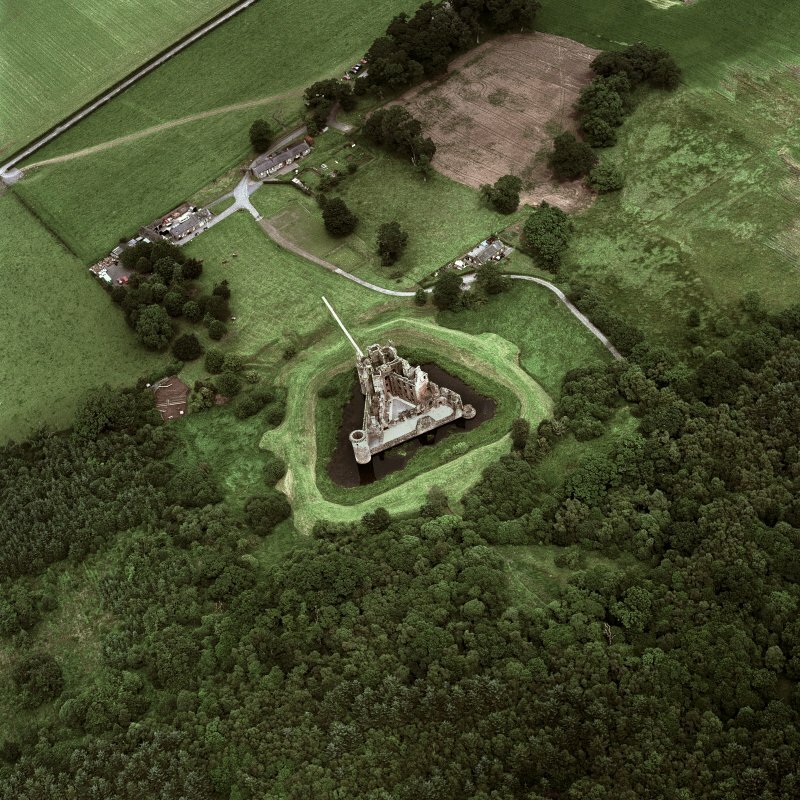 Oblique aerial view of Caerlaverock Castle, taken from the SW.
Caerlaverock Castle. Detail of bridge. Caerlaverock Castle. View of moat bridge. 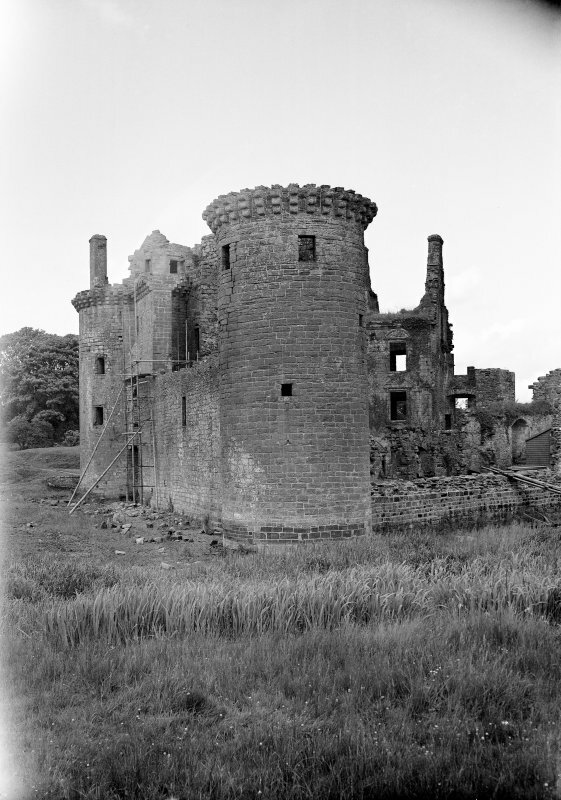 Caerlaverock Castle. Detail of stone carved term. Caerlaverock Castle. Detail of armorial panel. 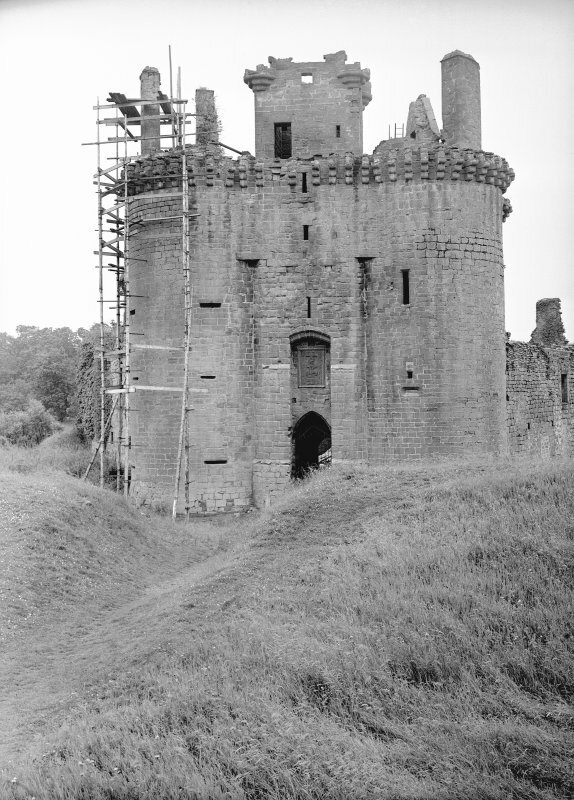 Caerlaverock Castle. 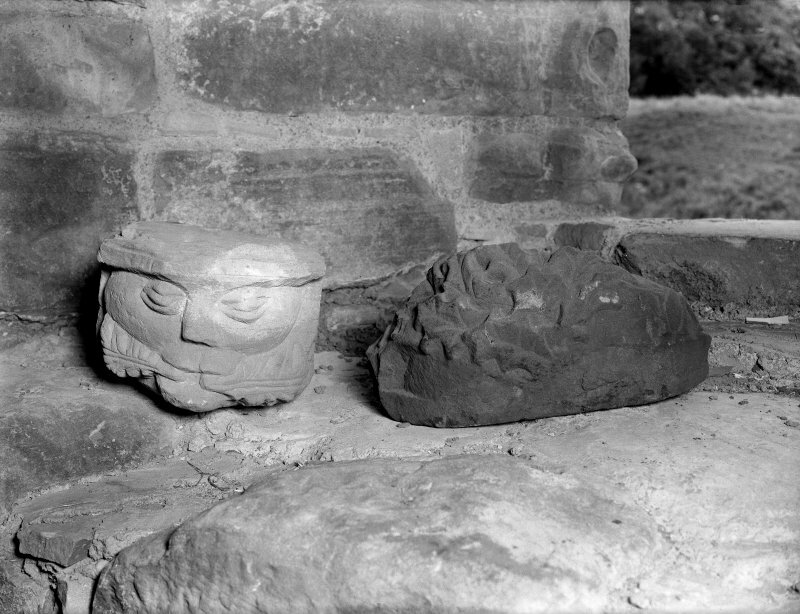 Detail of stone carvings. 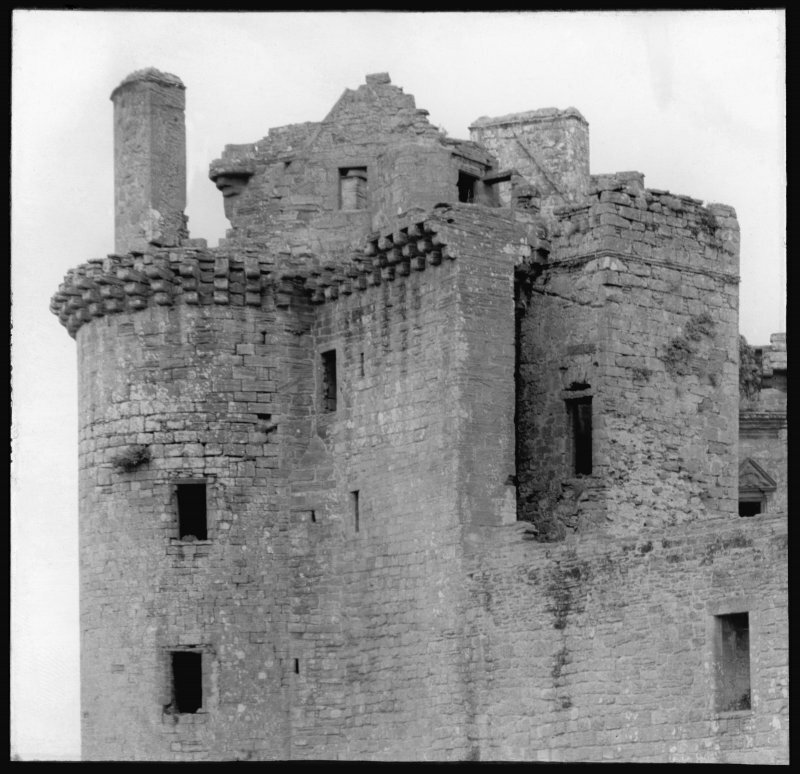 Caerlaverock Castle, interior. View of fireplace. 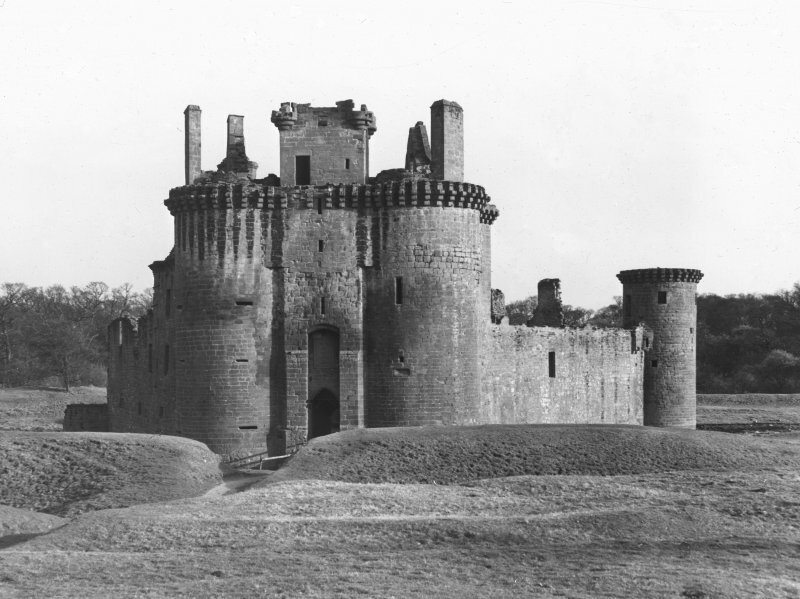 Caerlaverock Castle. View from East. Caerlaverock Castle. General view from North West. 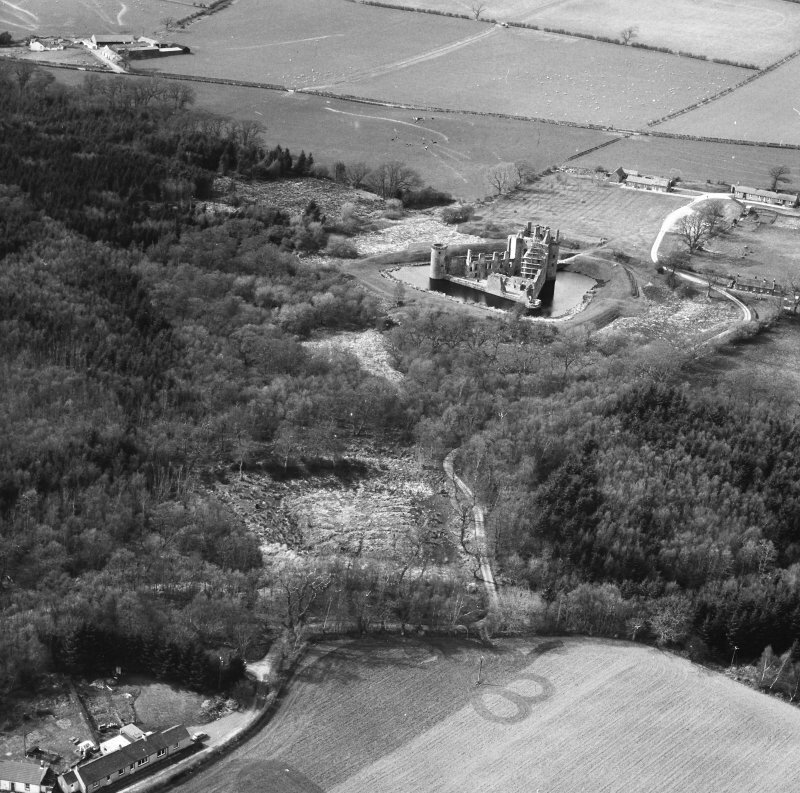 Oblique aerial view centred on the remains of Caerlaverock Castle, taken from the W.
Oblique aerial view centred on the excavation of the old castle with castle adjacent, taken from the ESE. 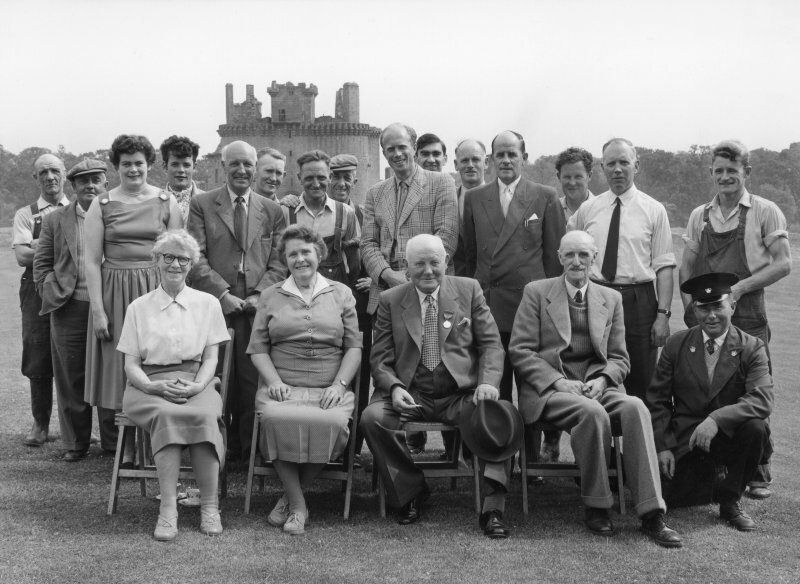 Excavation photographs: Presentation to former custodian at Caerlaverock. View of timbers of bridge found in moat. View of North East angle of coutyard. 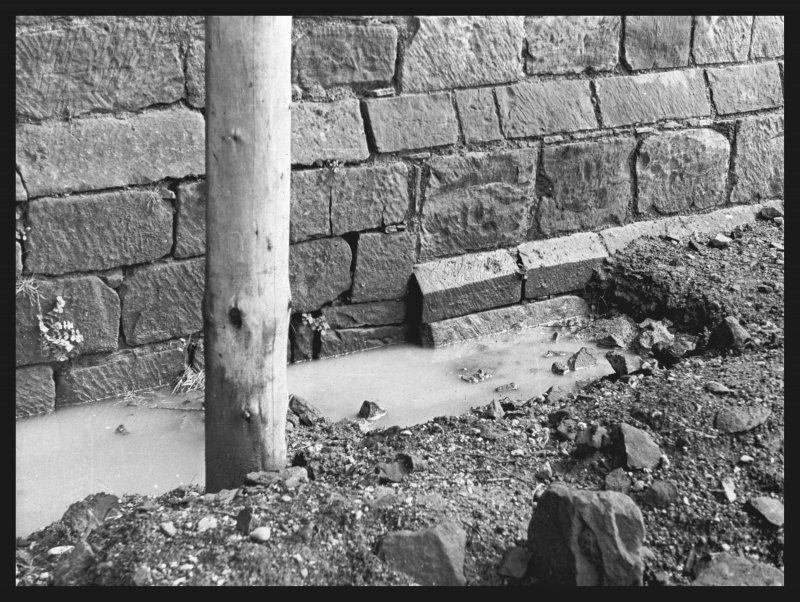 View of wooden post, ditch and wall. 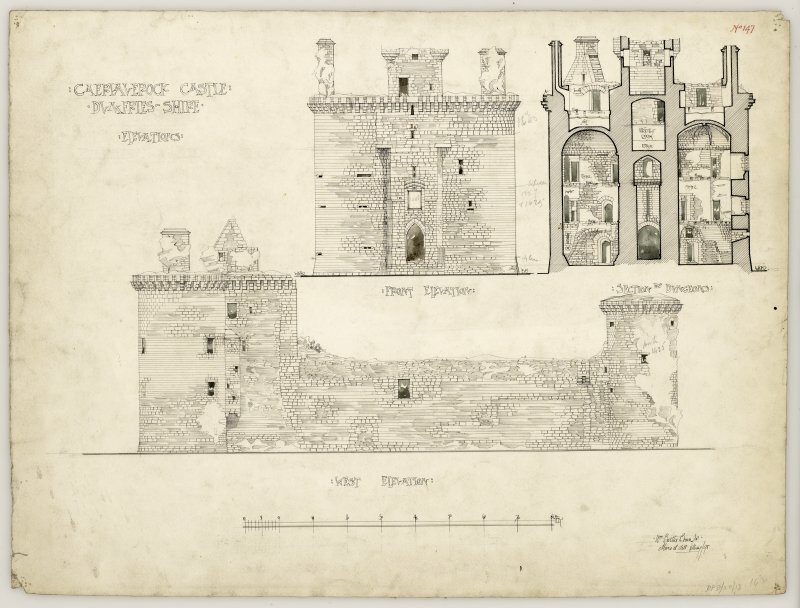 Section hrough Murdoch Tower and sections of Caerlaverock Castle. 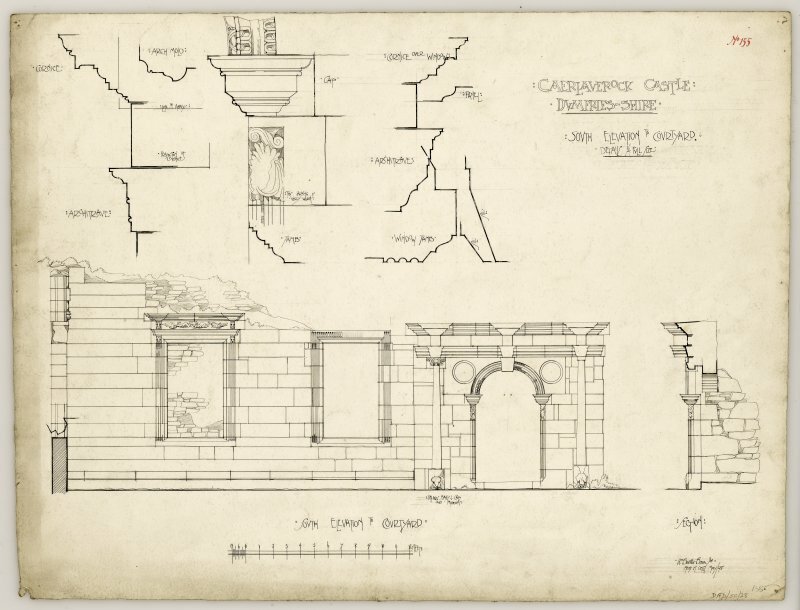 Front elevation, section through dungeons and west elevation of Caerlaverock Castle. 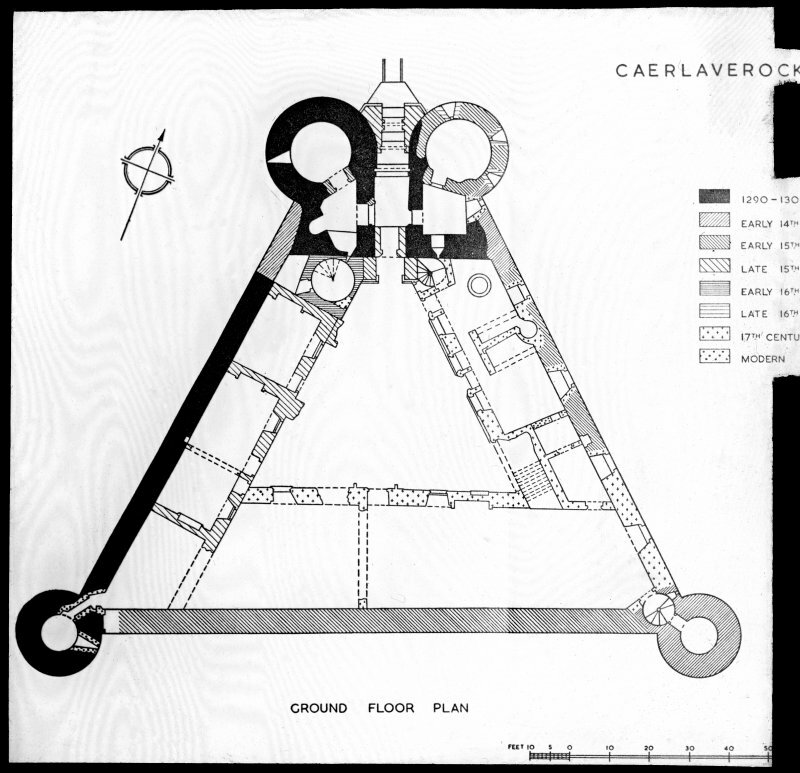 Second floor plan of Caerlaverock Castle. View of 17th century range. 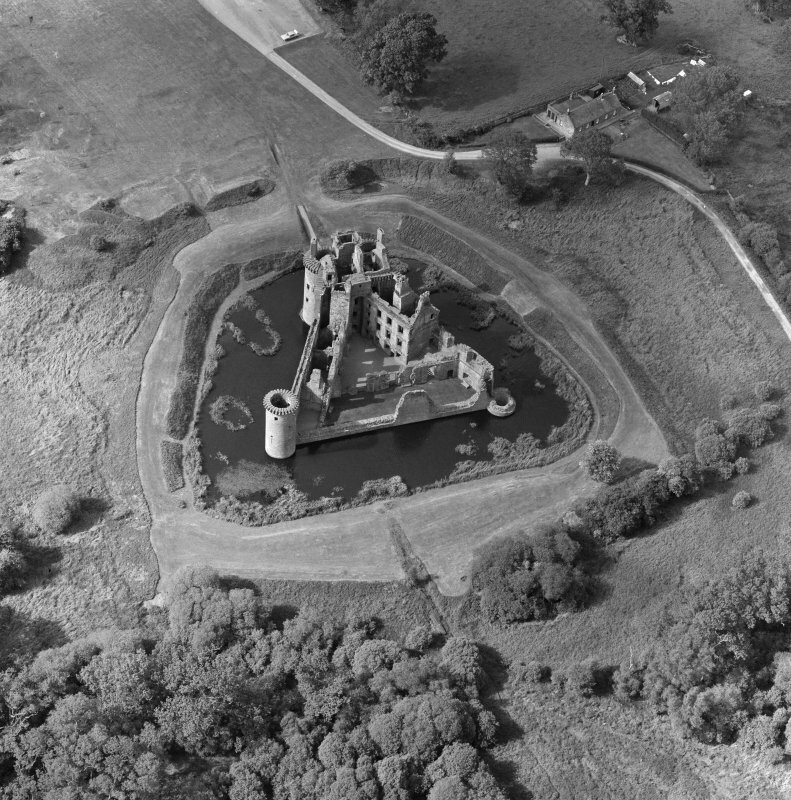 Oblique aerial view of Caerlaverock Castle, taken from the ENE. 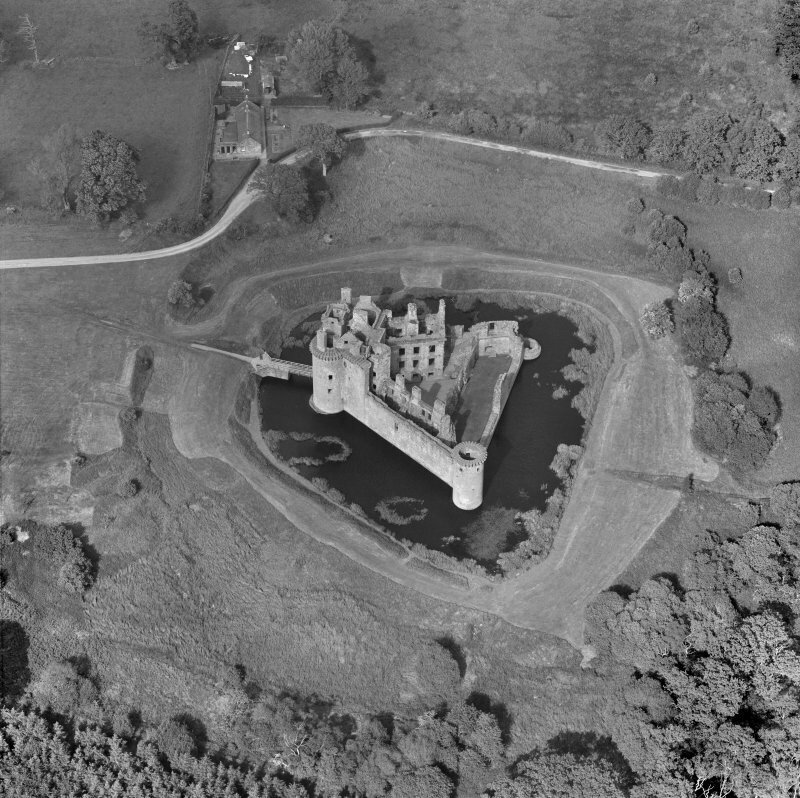 Caerlaverock Castle. General view from South. 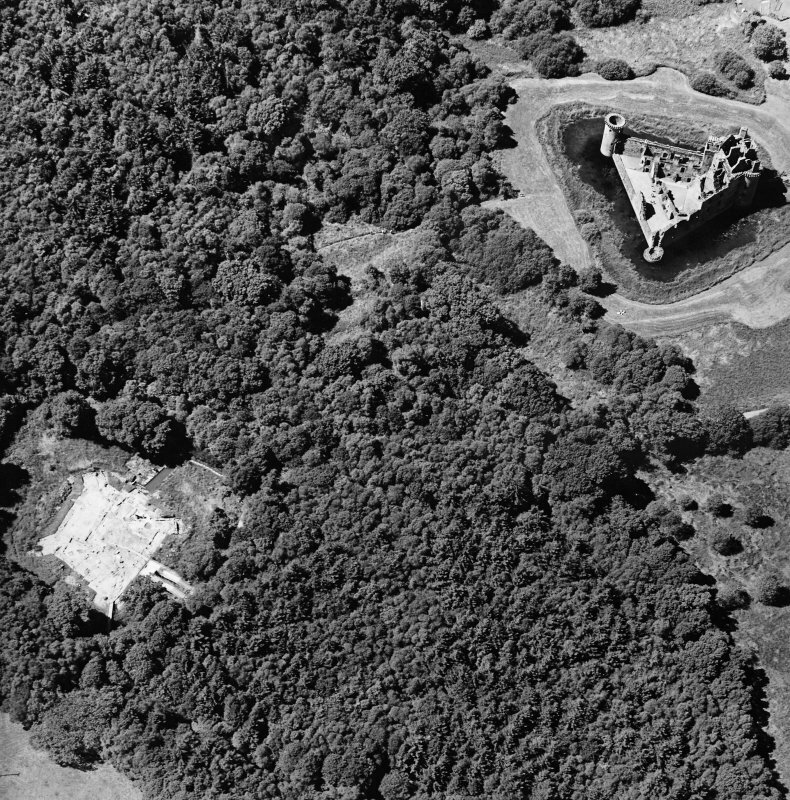 Oblique aerial view of Caerlaverock Castle centred on the castle with Old Caerlaverock Castle excavations adjacent, taken from the S.
Oblique aerial view centred on the excavation of the old castle with castle adjacent, taken from the E.
Oblique aerial view centred on the excavation of the old castle with castle adjacent, taken from the S.
Oblique aerial view centred on the excavation of the old castle with castle adjacent, taken from the SSE. 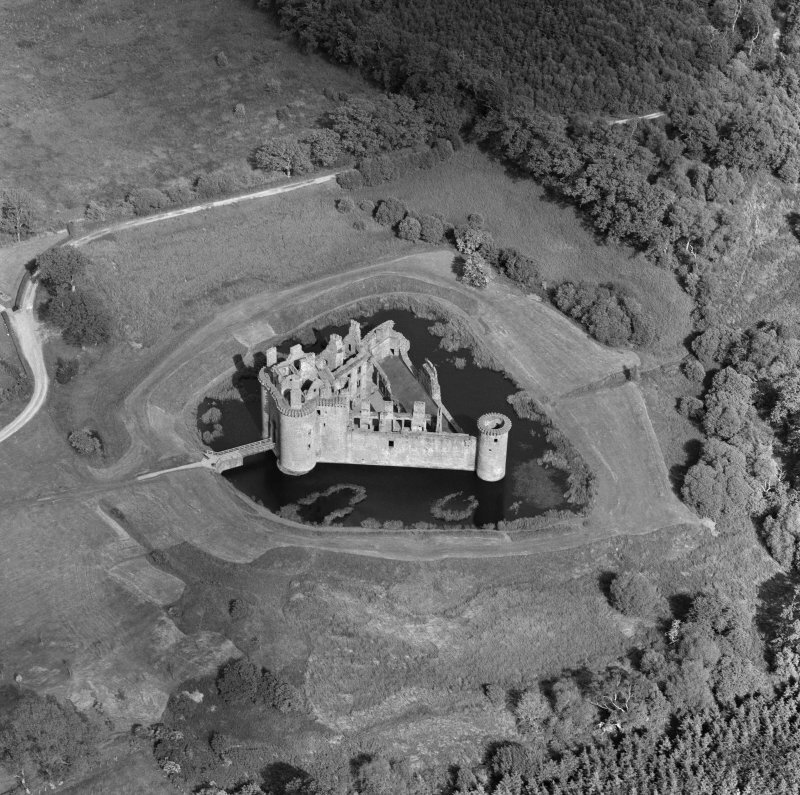 Oblique aerial view of Caerlaverock Castle from NW. 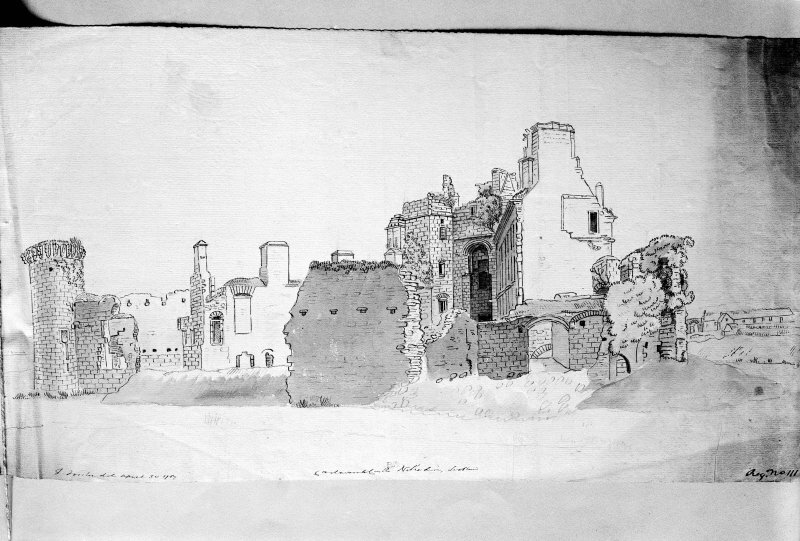 Northeast and south elevations of Caerlaverock Castle. 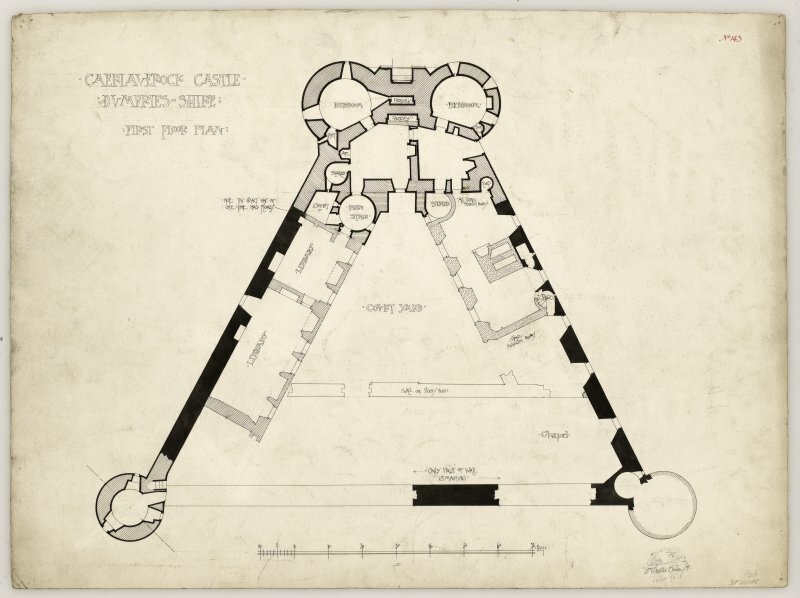 First floor plan of Caerlaverock Castle. Caerlaverock Castle. 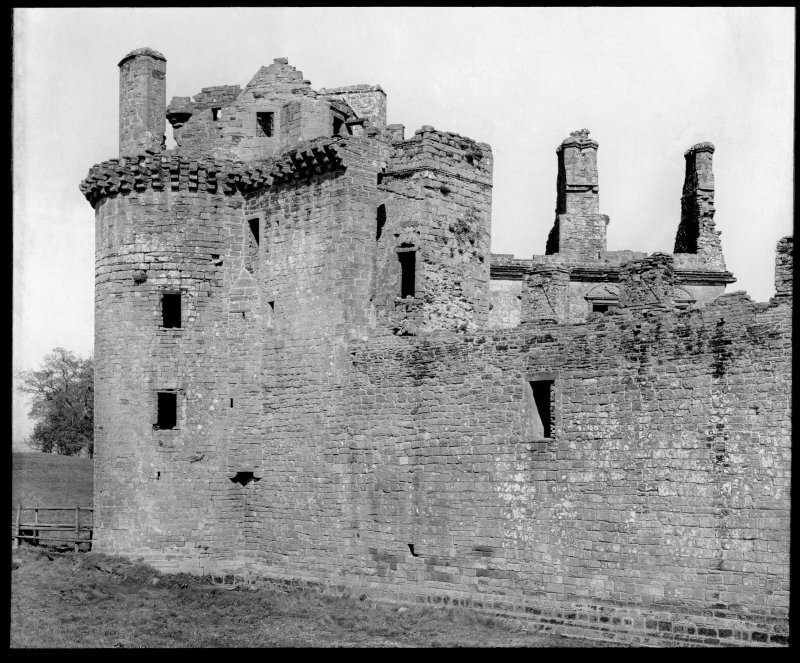 View of W curtain and base tower from SW.
Caerlaverock Castle. General view from North East. 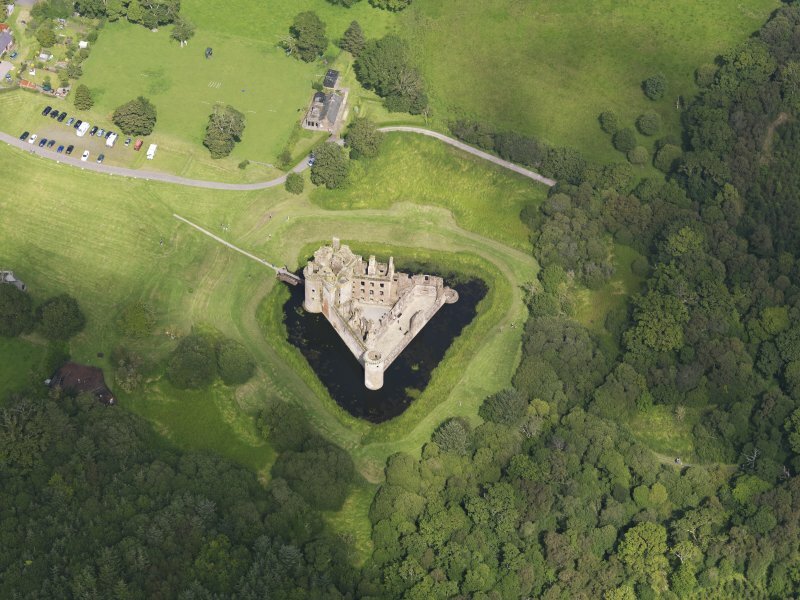 For Old Caerlaverock Castle (NY 027 654), see NY06NW 7. 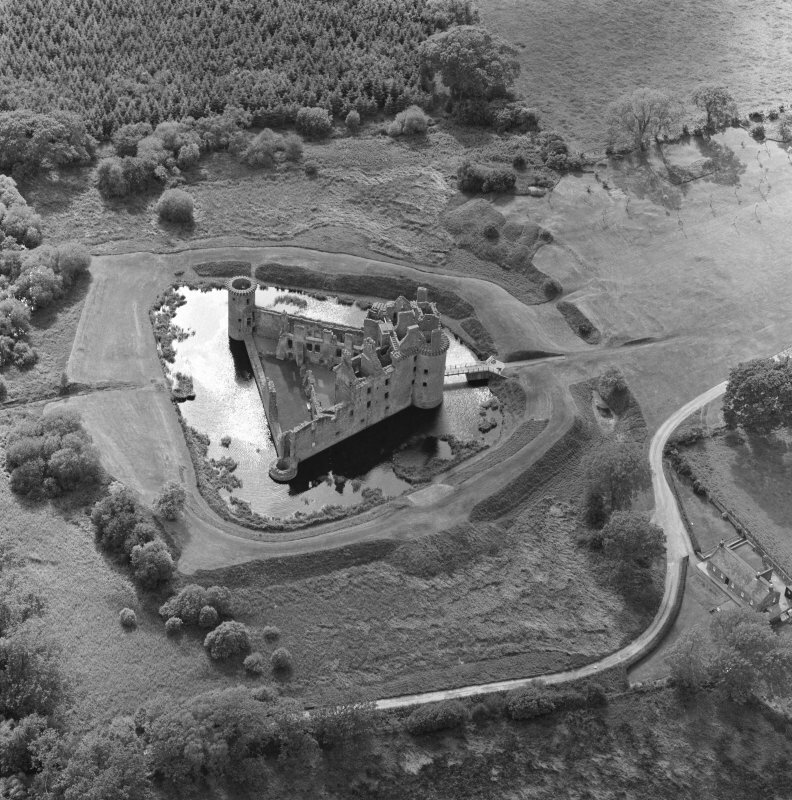 Caerlaverock Castle, fully described in the DoE Guide (B H St J O' Neil 1952) was built about 1290, replacing that described on NY06NW 7. 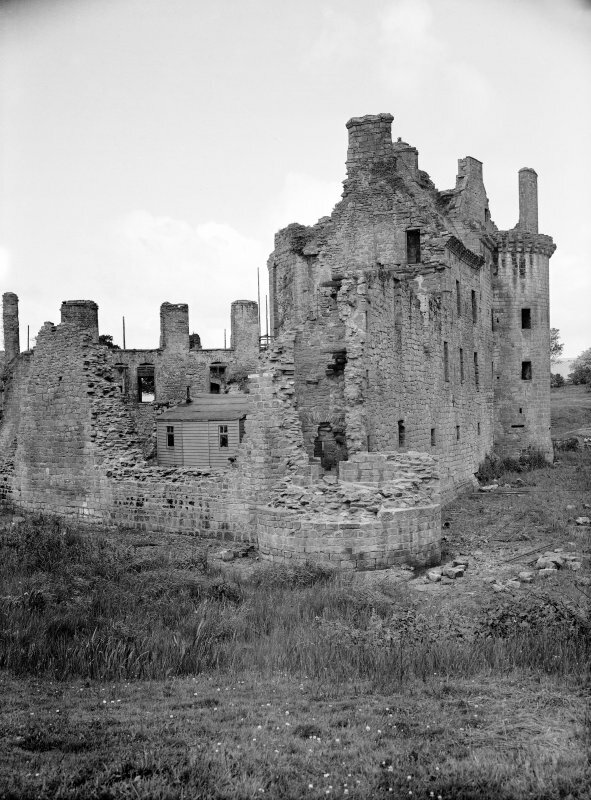 There were only short breaks in occupation from then until its destruction in 1640, after a siege by Covenanters. Though it was slighted and rebuilt several times during that period, the later builders have followed the original design. 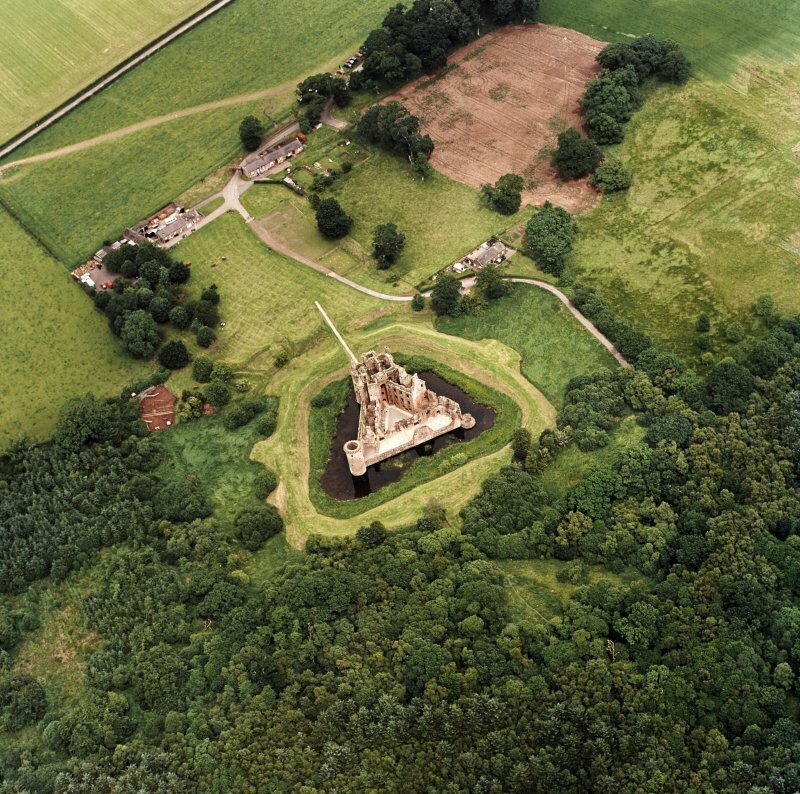 The castle can only be approached from the N. Here there is a rectangular outer courtyard on the slope of the hill; it is entered by a round-arched stone gateway of uncertain date at its NE corner. A low bank round the courtyard suggests that it may once have been defended. 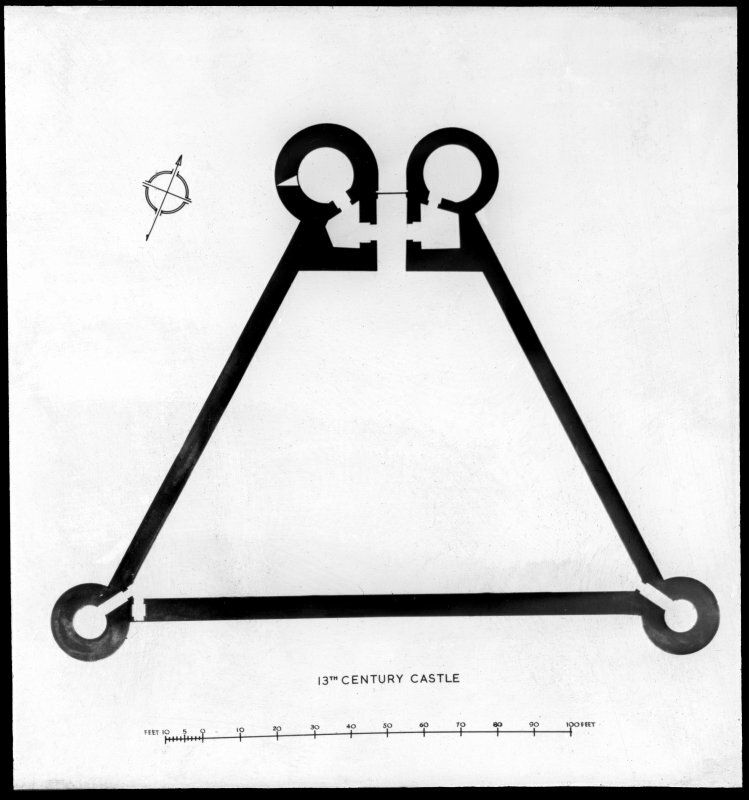 Triangular on plan, the castle has massive twin drum-towers and a backing keep or gatehouse at the apex, and circular flanking towers at the other two angles, that to the SW remaining entire. 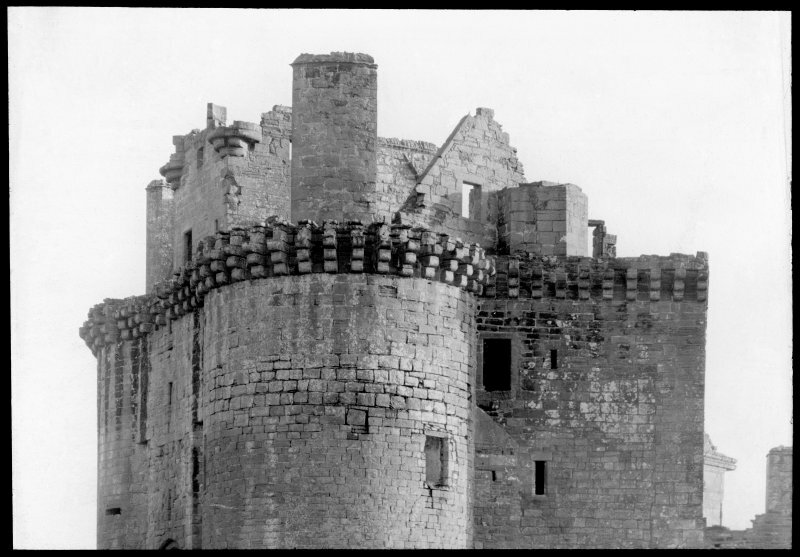 High curtain walls link these towers, enclosing a courtyard; subsidiary buildings have been erected against these walls by a wide moat, beyond which have been earthworks and outer ditches, some of which were modified to create defences during the 1640 siege. 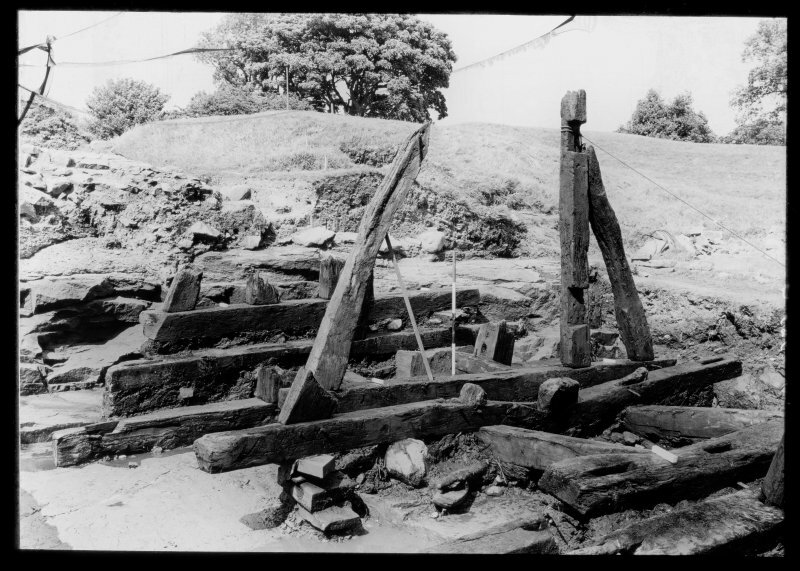 Excavations have revealed remains of four successive timber bridges crossing the moat. 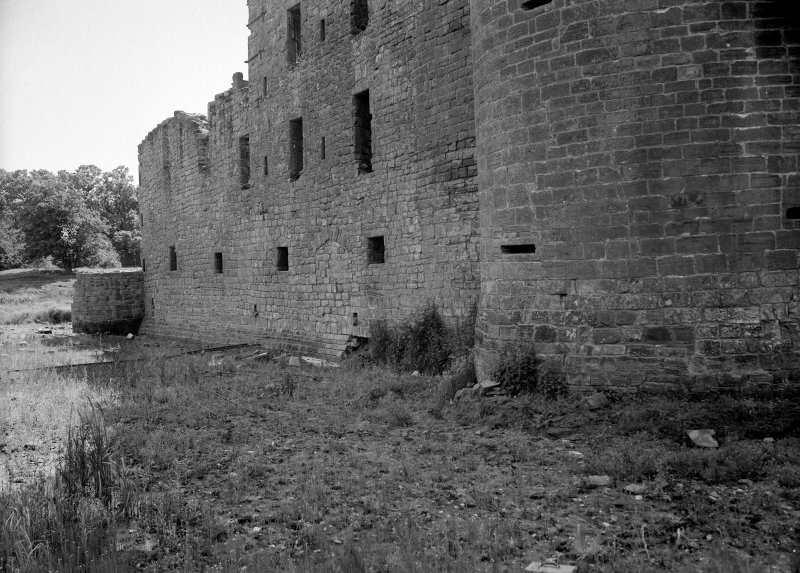 Little of the S range of the castle remains, but elsewhere the building is, at least externally, mainly entire to the wallhead. 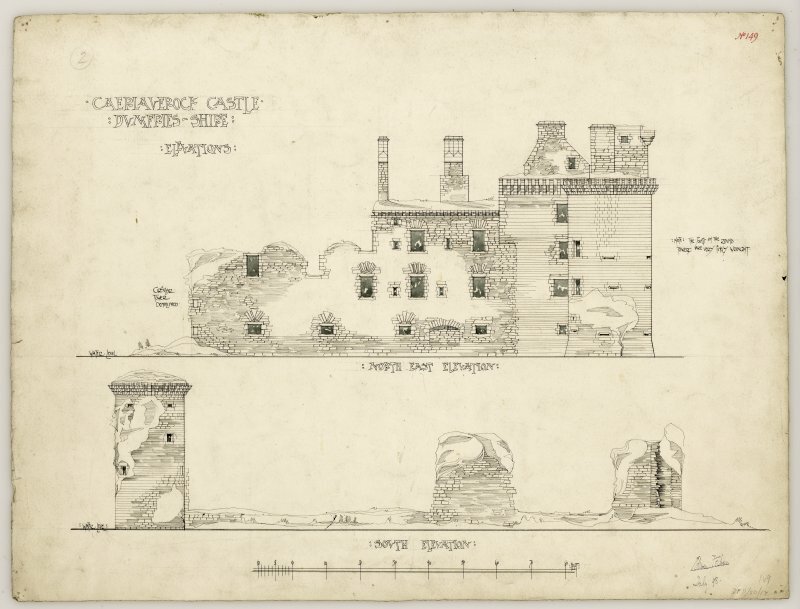 This castle is as described and illustrated by the previous authorities. 3 fragments of medieval Pottery found while excavating in Caerlaverock Castle, Dumfriesshire, 18 years ago. Factor Lord Herries. NY 0255 6560 Excavation of a trial pit prior to the creation of a soakaway was monitored in October 1999. 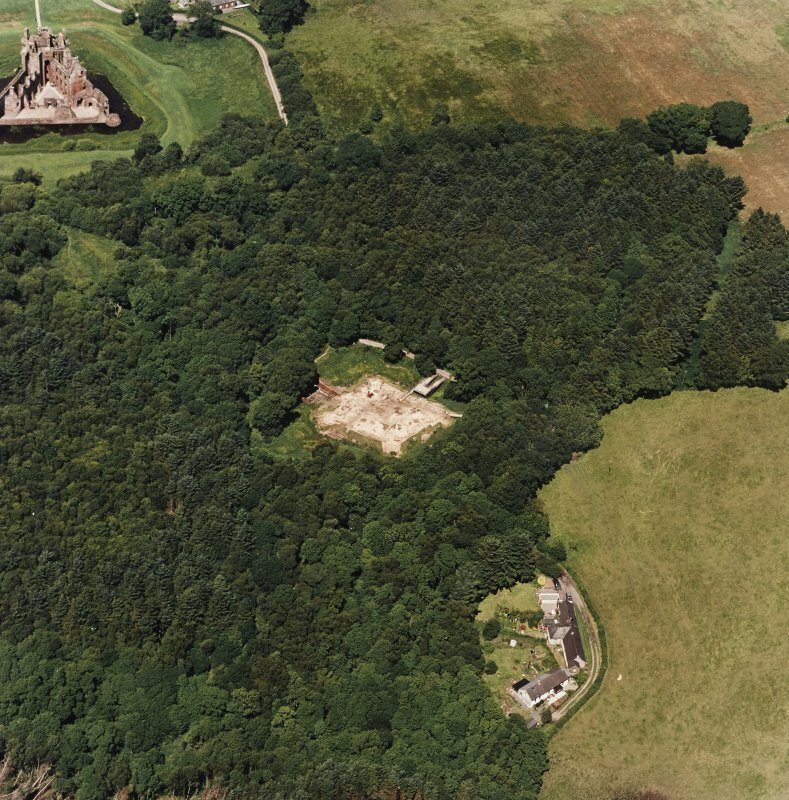 The trial pit was located in the W corner of the field to the E of the Guardianship area, and was up to 2.5m in depth. The excavations indicated that the surface scarp noted in the field is the line of a raised beach. No deposits of archaeological significance were disturbed. The subsequent programme of drainage improvements was carried out in late February 2000, again with archaeological monitoring. These works involved the machine-excavation of a trench 58m long with a depth ranging from 300-950mm. In the area to the N of the car park excavations revealed a complex area of cobbling, demolished walls and late cuts. Examination of this group of features suggested the existence of a cobbled surface, complete with central surface drain, with a width E-W of almost 10m. The surface appeared to be bounded to the E and W by roughly built red sandstone walls, with the possible existence of a central wall just W of the surface drain. The cobbles were sealed by up to 500mm of demolition debris, mounded up in the E and centre of the structure, and lensing out to the E and W. A late drain appeared to be cut into the position of the E wall, while a wide depression-like cut filled with debris and redeposited natural lay over the W wall. The whole was sealed with between 100-250mm of topsoil. There is clearly a substantial structure existing to the S of the cottages adjacent to the entrance archway which may have been partly removed by the new car park. 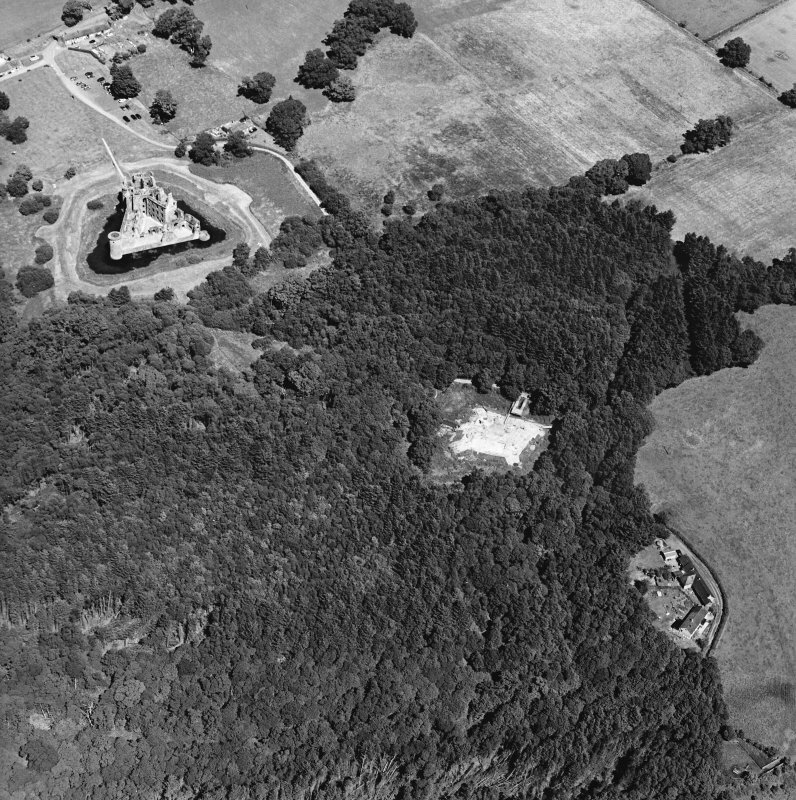 The structure appears to be a large cobbled compound of some sort, aligned N-S, which may have had a perimeter wall and been unroofed. No slates or tiles were found in the demolition debris covering the floor levels. The surface drain seems to indicate that livestock may have been housed within the structure. 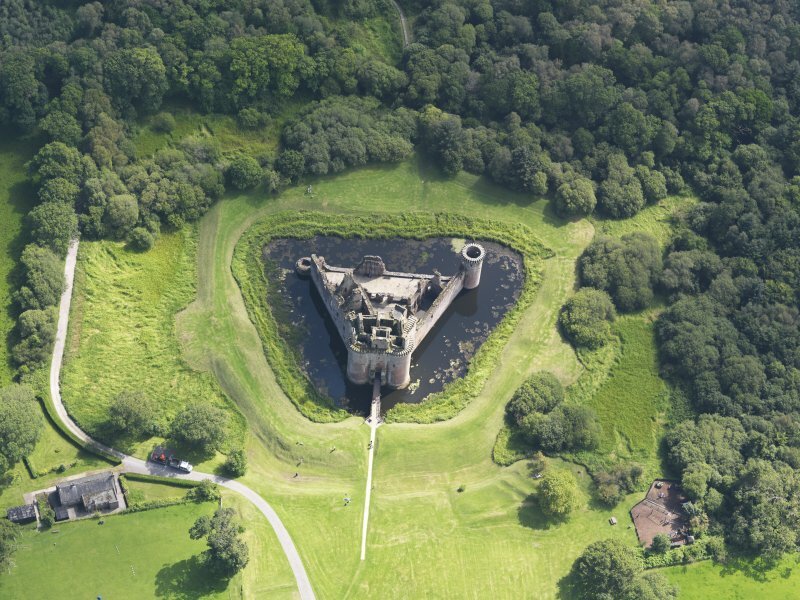 NY 025 656 Monitoring works at Caerlaverock Castle comprised the excavation of soakaway trenches in the grazed pasture field to the W of the Guardianship area, WSW of the visitor centre, and a hole for a septic tank to the SW of the toilet block. The monitoring of the soakaway trenches was undertaken on several visits during October, November and December 2001, and the excavation of the pit for the septic tank was monitored in January 2001. This part of the Guardianship area has been used for dumping debris as well as for the creation of the car park. However, this material appears mostly to have sealed the surviving archaeology rather than destroying it, although it did stop the geophysical surveys from picking up the remains. The ditch cut also shows that archaeology survives below the pasture, despite it having been ploughed in the past. These are encouraging results for the survival of medieval remains in a superficially unpromising part of the monument. 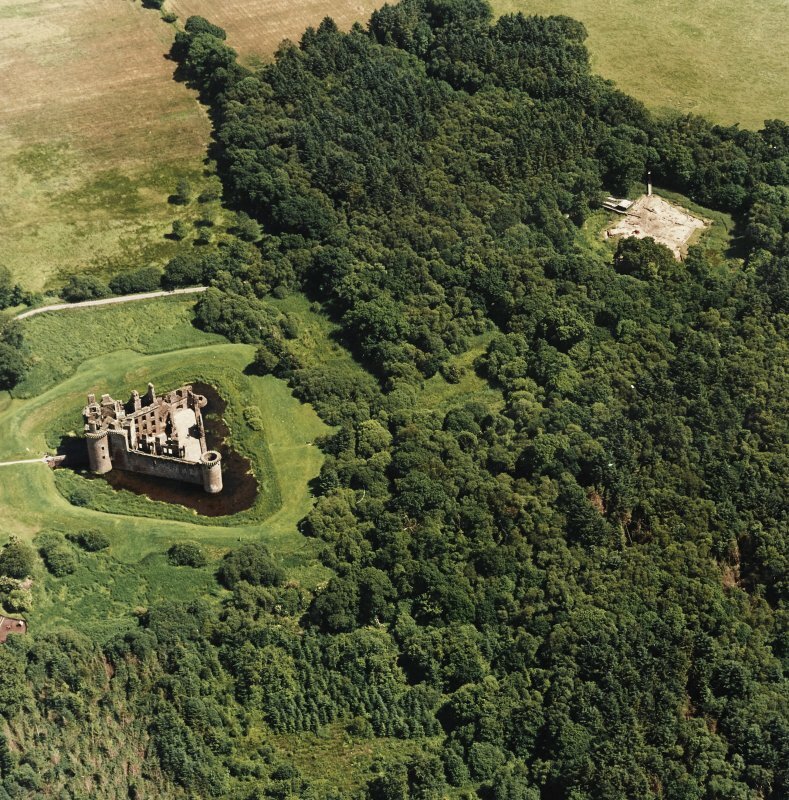 A watching brief was also undertaken in the woods to the S of Caerlaverock Castle while trees were felled. 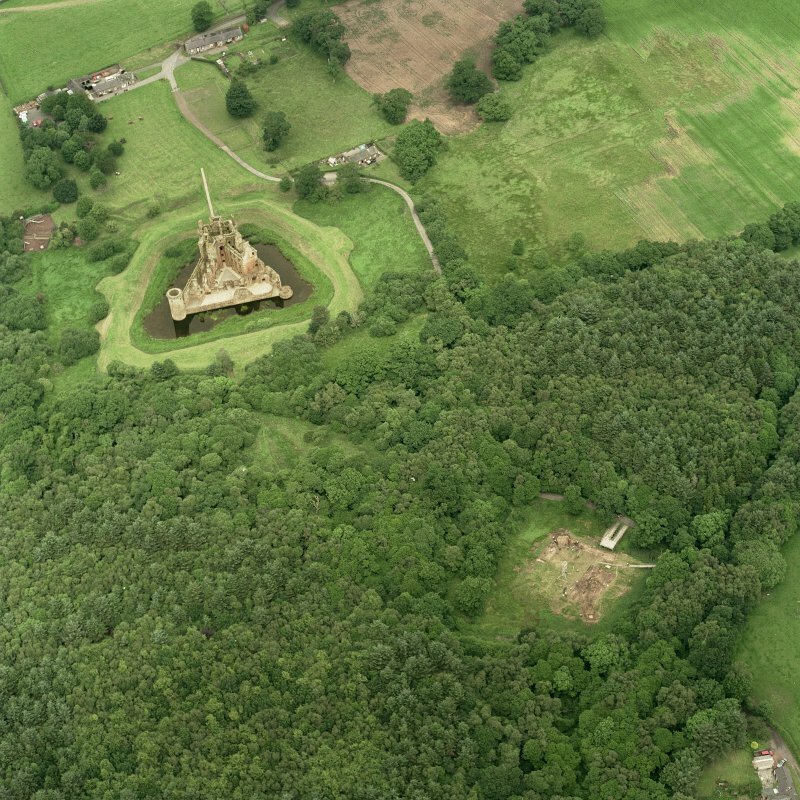 There was no significant damage to the earthworks. 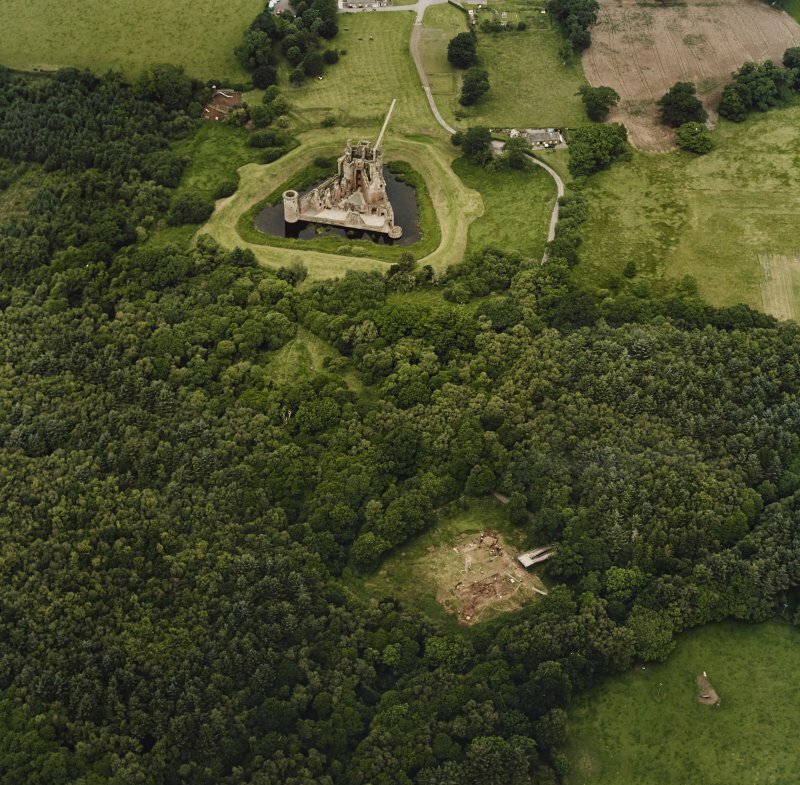 The features recorded show that the earthworks in the wooded area of the Caerlaverock Estate are more complex and extensive than usually depicted. 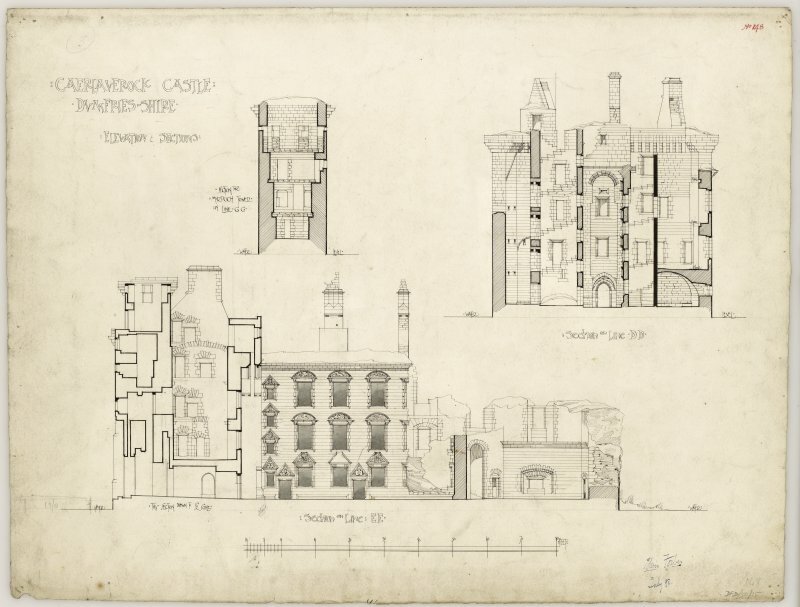 It may be possible, with further work, to identify which features are associated with the old castle, with the sieges, with water catchment and with later estate management, potentially including the use of the grounds as romantic pleasure gardens. G Ewart and P Sharman 2002. NY 025 656 Archaeological monitoring was undertaken in August 2004 while contractors hand-dug a telephone cable trench in the field to the N of the monument. Nothing of archaeological significance was seen in this long slit trench. NY 0252 6582 Archaeological monitoring was undertaken in November 2004 while a post-hole was dug in the field to the N of the monument within the Guardianship area of Caerlaverock Castle (NY06NW 6). Nothing of archaeological significance was seen. NY 025 656 Reconnaissance coring of the sediments of the moat systems of Caerlaverock New Castle. 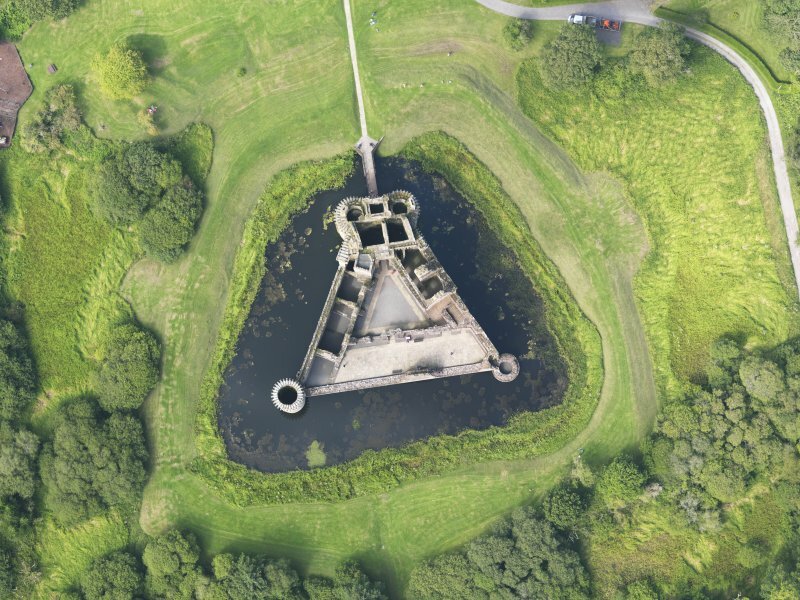 The results of sediment coring within the outer moat are that the highly organic pond and peat sediments infilling the outer moat are interrupted by distinctive inwashed bands of grey minerogenic silty clays and clays. These are recorded up to 8.5 m OD. 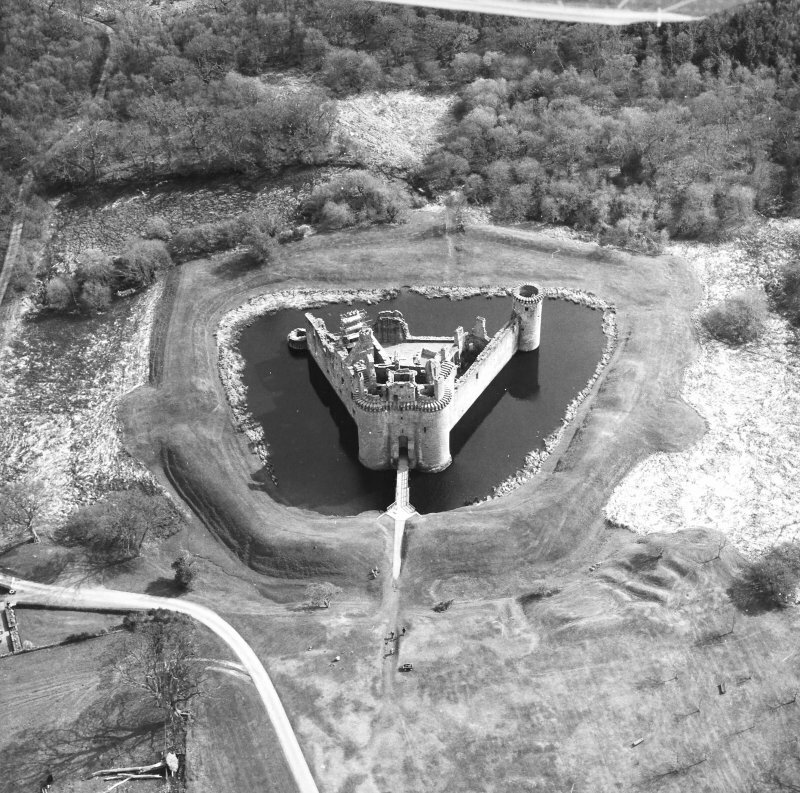 The data provisionally suggest that the outer moat may have been impacted by extreme marine flood events that were to at least this altitude, in the same way that the moat system at the Old Castle had been inundated. This interpretation remains tentative until definitive sediment- and bio-stratigraphic analyses can confirm the marine origin of the minerogenic sediments, but if confirmed would represent evidence for the most exceptional Medieval and post-Medieval marine inundation of all of the lower Lochar Valley. NY 025 656 Archaeological monitoring was undertaken during the digging of five trenches to establish the nature of the ground make-up to the N of the castle. This work was carried out in June 2006 in advance of the potential installation of a new drainage system. New drains were considered necessary since sustained periods of rain had been seen to leave areas waterlogged. This trenching activity allowed a profile to be established in the proposed route of future drainage, and that there is a variation in the ground make-up from natural deposits to various road phases to modern landscaping. Partially revealed, unmortared masonry may be a reduced field wall. 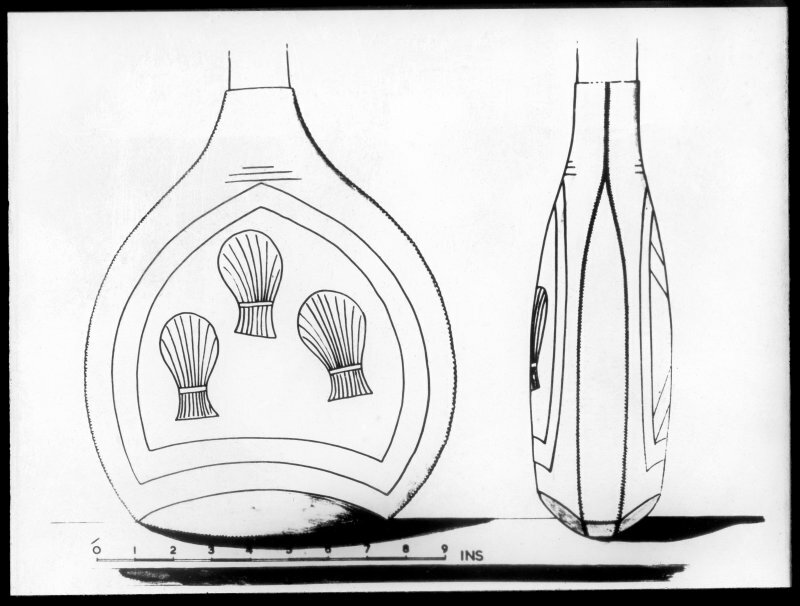 There were no other finds or features of archaeological significance. Paul Fox and Thom Walley, 2006. NY 025 656 Archaeological monitoring was undertaken in August 2006 during the digging of five small trenches to hold the poured-concrete foundations of new information boards. There were no finds or features of archaeological significance. the excavation of two soakaways and two drainage channels alongside the current road and SE car parks. An additional day of monitoring was required during the removal of the road's subbase over a 56.4m section. During these works a field drain and wall were partially revealed. Neither feature was thought to be earlier than 18th-century in date. visitor centre as part of works to replace an existing underground electricity cable. The works caused no disturbance to any previously undisturbed ground, and the trench ran through an area of much recent disturbance and landscaping. There were no finds or features of archaeological significance. 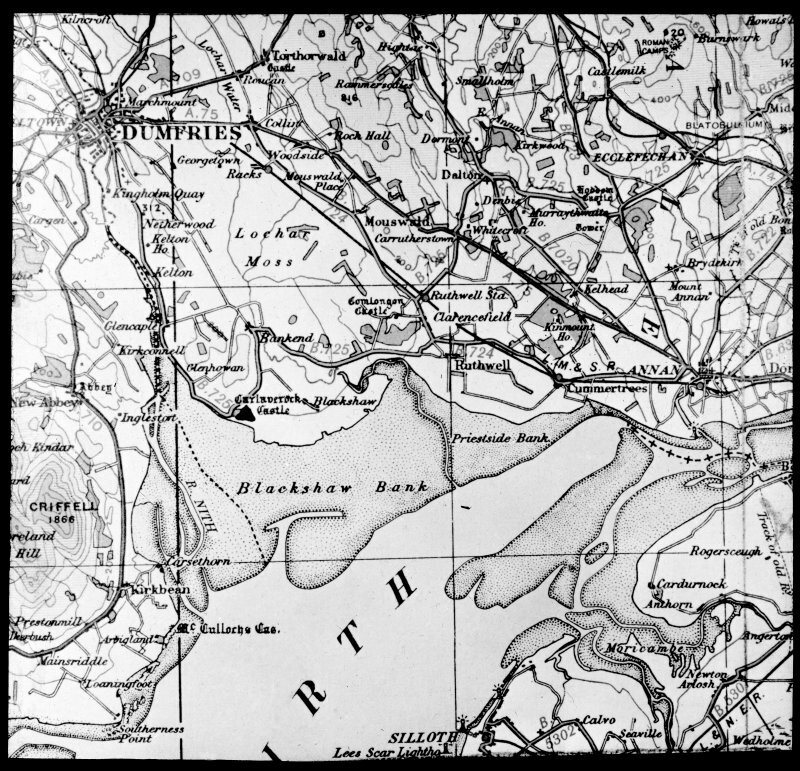 at the time, was finally claimed as treasure trove in 2006 and allocated to Dumfries and Galloway Museums (Dumfries) (TT 94/06). Although published (Yates 1979), this discovery was too late for inclusion in Schmidt and Burgess's corpus of Bronze Age axes from Scotland and northern England (1981). In terms of their typology, the smaller axehead falls within the range of Migdale type axes, although its outline may have been modified by reworking and that it may originally have been larger. 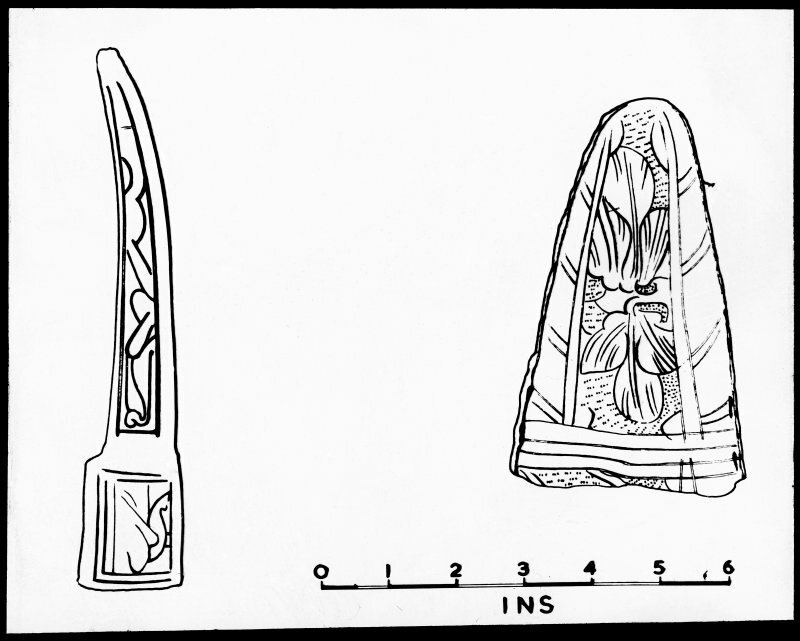 The larger axehead can be compared most closely in terms of overall shape, if not exact size, with axes of the Biggar variant of the Migdale type or among some decorated Migdale axes. In the light of these features, the hoard is likely to date to the later part of the Brithdir stage (2150-2000 BC) in Rohl and Needham's scheme outlining developments in Early Bronze Age. 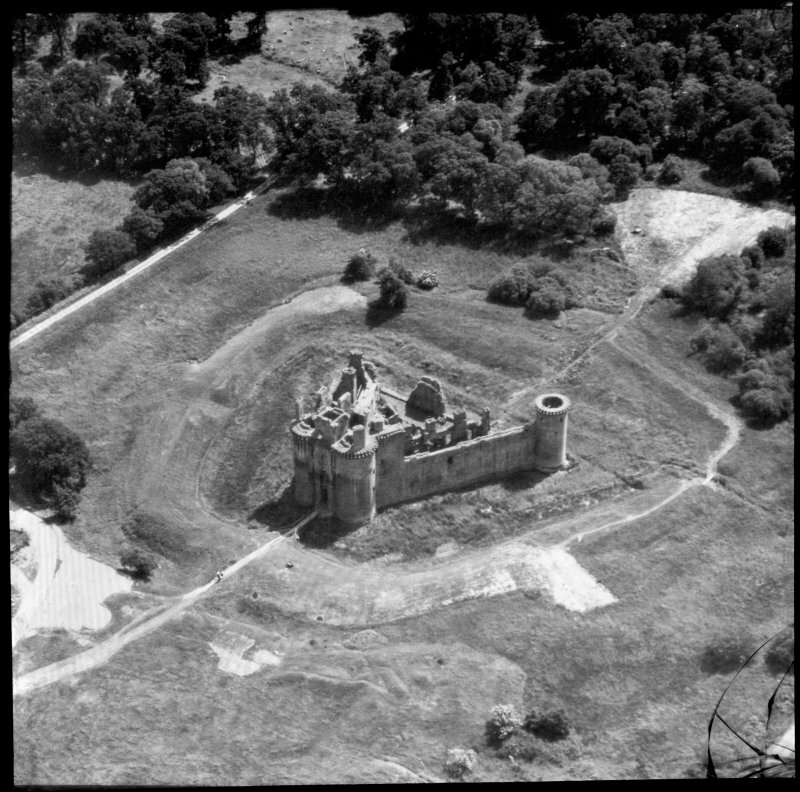 Oblique aerial photographs of Caerlaverock Castle taken by Mr John Dewar in 1972. 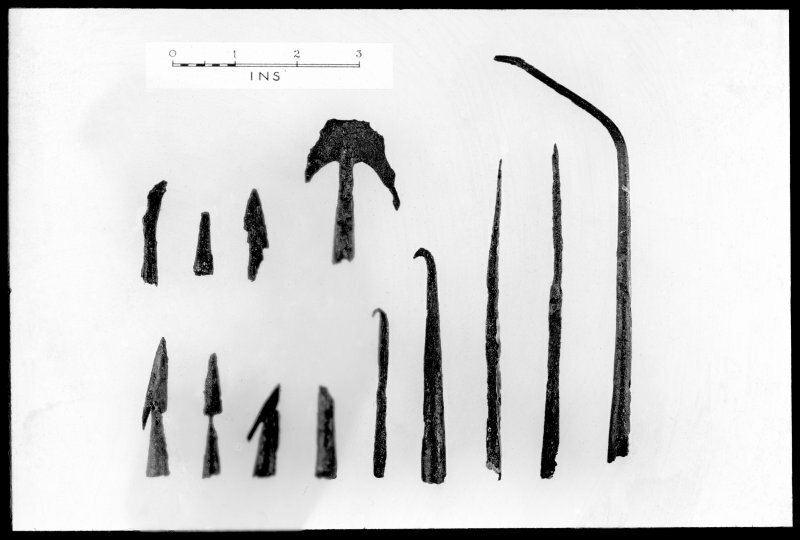 NY 025 656 A probable hoard of two EBA bronze axeheads, found in 1976 but not formally allocated to a museum service at the time, was finally claimed as treasure trove in 2006 and allocated to Dumfries and Galloway Museums (Dumfries) (TT 94/06). 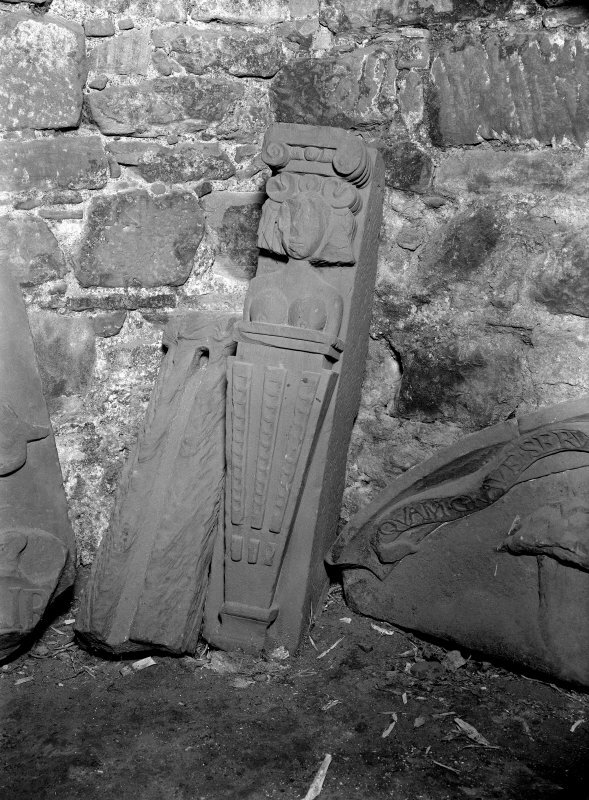 Although published (Yates 1979), this discovery was too late for inclusion in Schmidt and Burgess's corpus of Bronze Age axes from Scotland and northern England (1981). 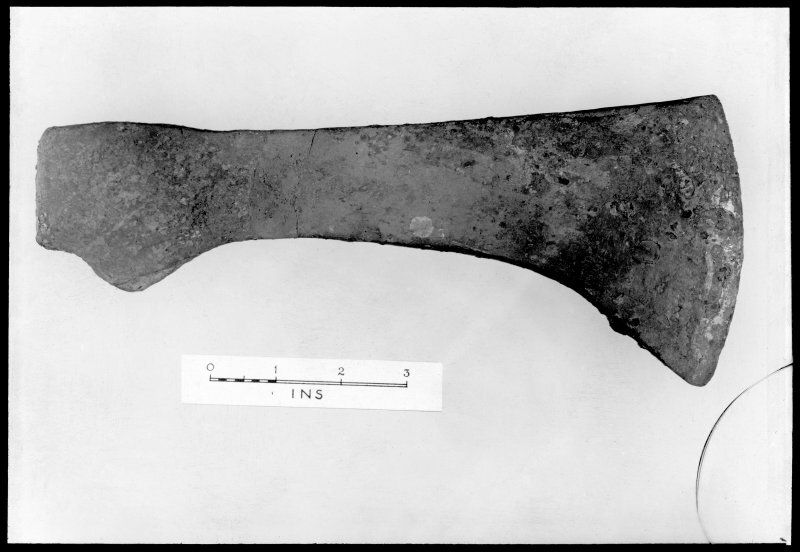 In terms of their typology, the smaller axehead falls within the range of Migdale type axes, although its outline may have been modified by reworking and that it may originally have been larger. The larger axehead can be compared most closely in terms of overall shape, if not exact size, with axes of the Biggar variant of the Migdale type or among some decorated Migdale axes. In the light of these features, the hoard is likely to date to the later part of the Brithdir stage (2150-2000 BC) in Rohl and Needham's scheme outlining developments in Early Bronze Age. 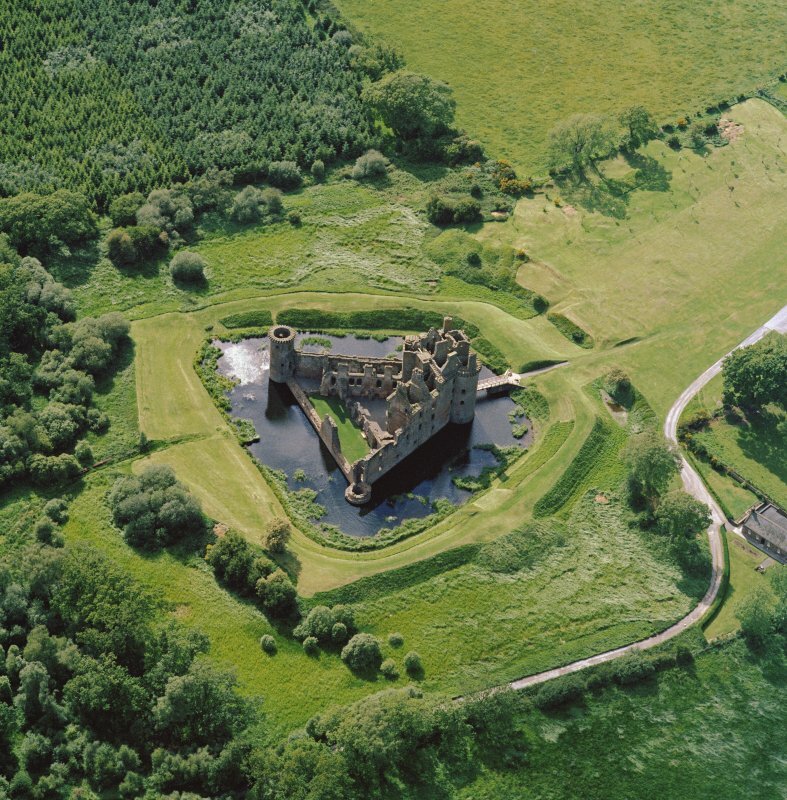 Caerlaverock is, without doubt, the region's premier castle. Its appearance in dazzling red sandstone conveys an impression both of solid strength and dignifIed splendour. 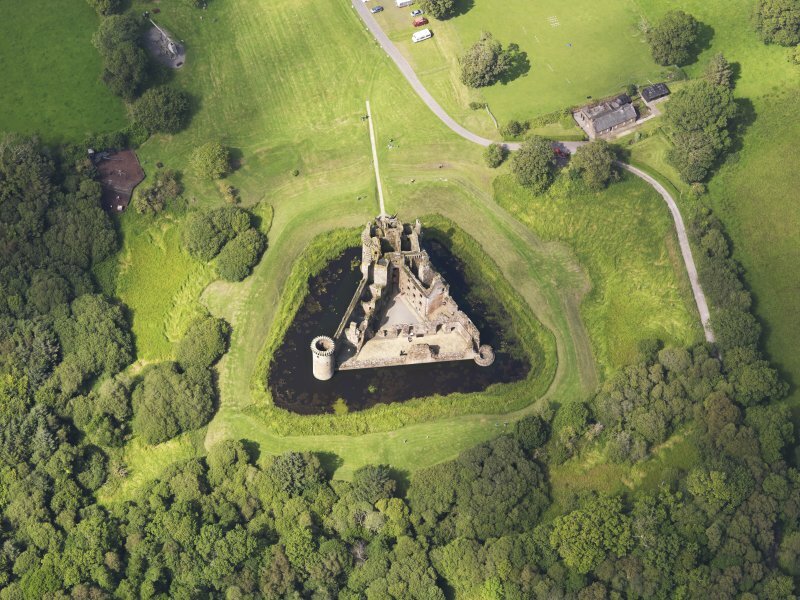 The double-towered gatehouse and triangular layout, surrounded by a water-fIlled moat and earthen rampart, display some of the changes in design that were induced partly by Edward I's castle-building activities in the last quarter of the 13th century. 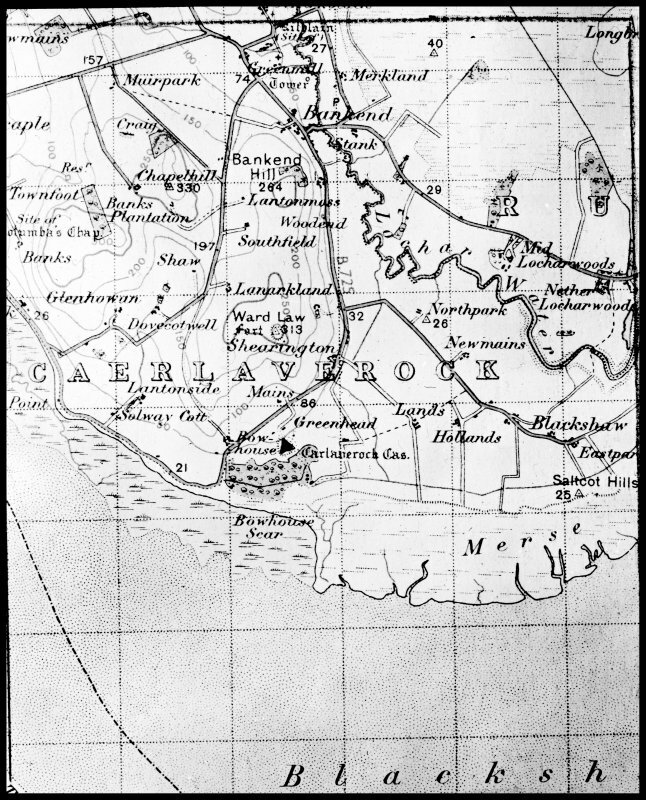 Caerlaverock itself is of late 13th century origin, but, curiously, we know neither the identity nor even the nationality of its builder. 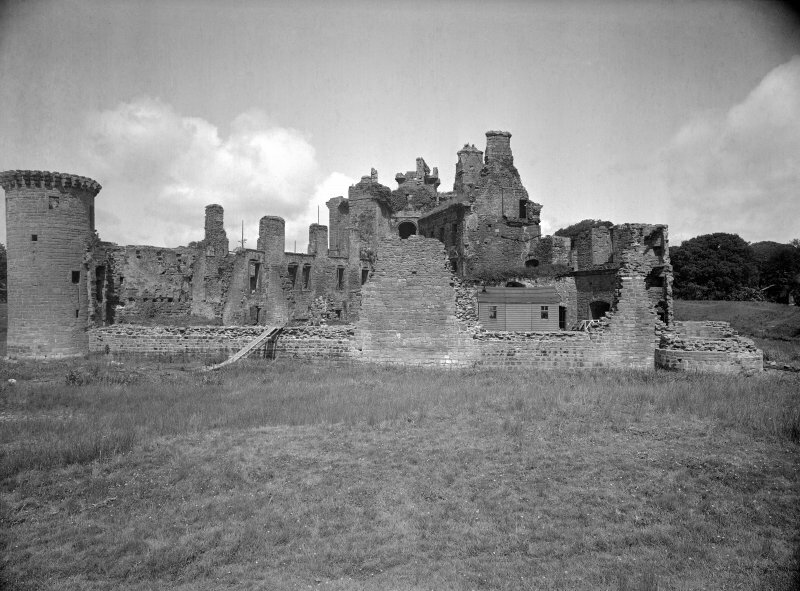 The singular shape of the castle, unique in Britain, is recognisable in this description. 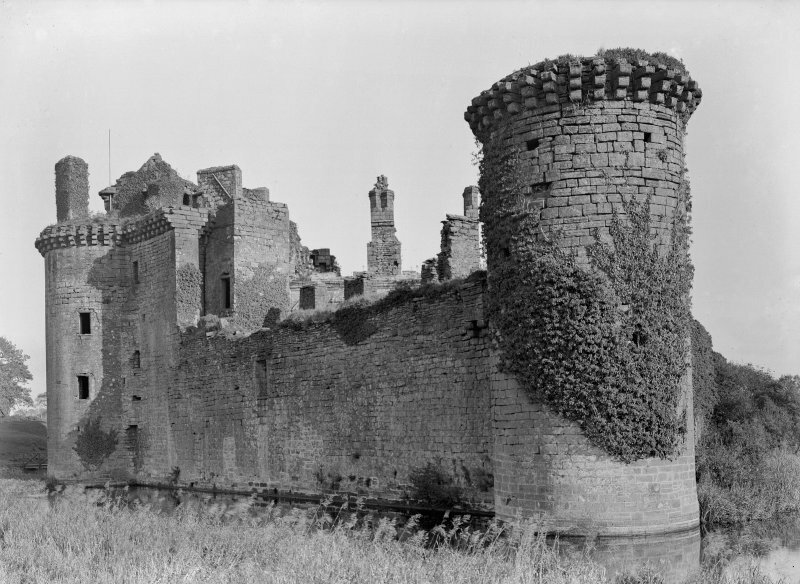 Much of the original masonry is still discernible, particularly in the western curtain-wall and gatehouse-tower, although Caerlaverock suffered badly in the course of later Anglo-Scottish warfare. 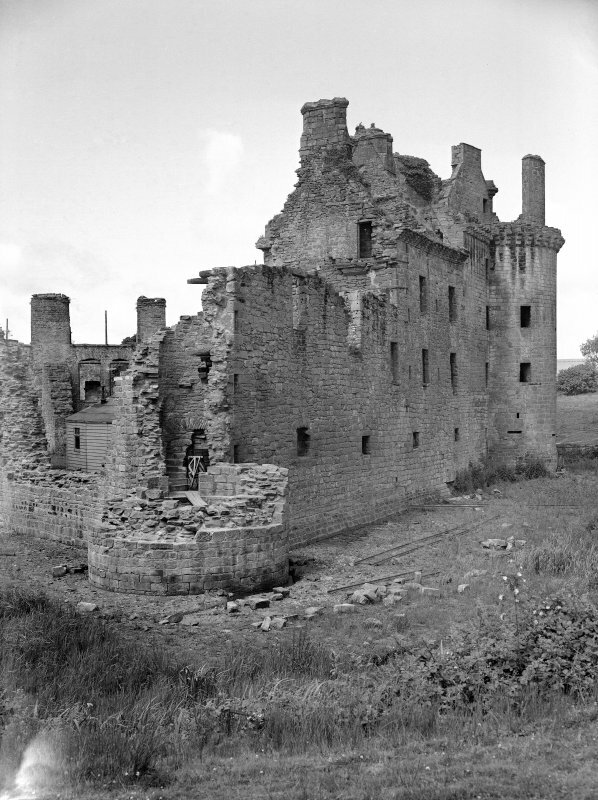 But just how far the 'destructions' wrought in about 1312 (by the Scots) and 1356-7 (by the English) rendered the castle unusable, and how much rebuilding was undertaken in the 14th century are difficult questions to answer. 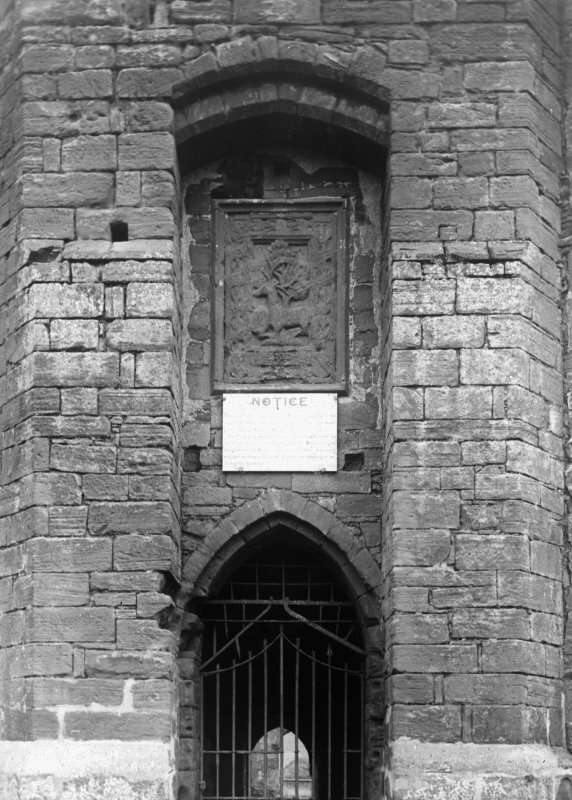 It is clear that the defences of the castle were restored and improved in the 15th and 16th centuries by the Lords Maxwell, whose armorial is carved above the main gateway. 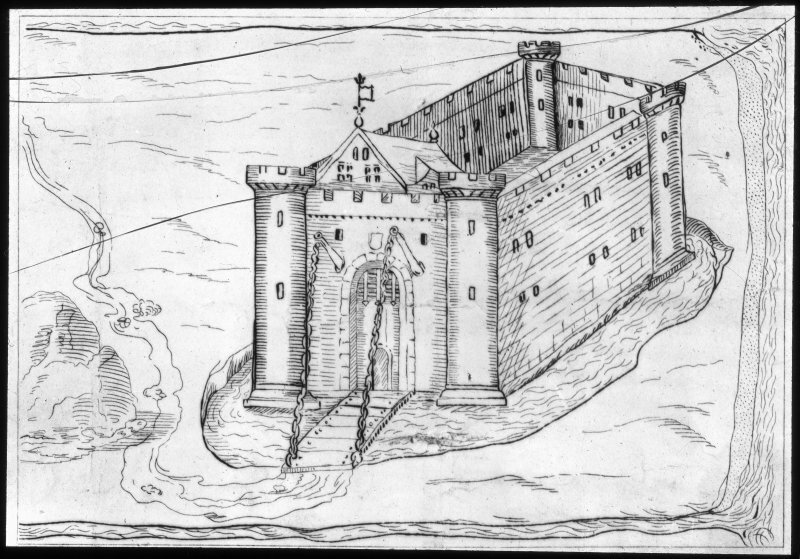 The curtain-walls and eastern gatehouse-tower were reconstructed, and additions were made to the gatehouse itself; the wide-mouthed gun-ports were probably inserted when repairs were in hand in 1593. 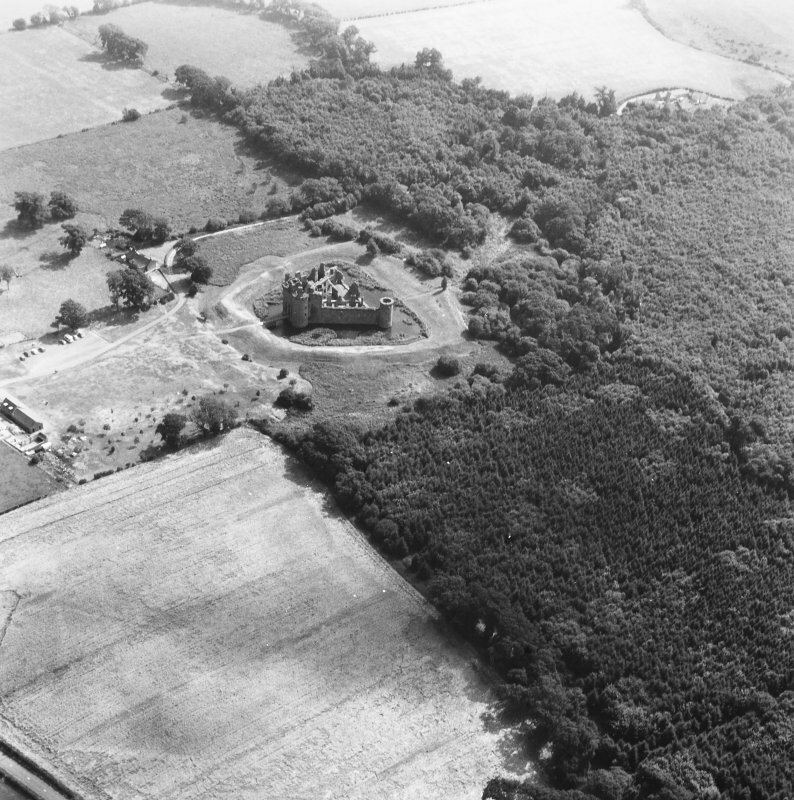 The castle was among those 'thrown down' by an English army in 1570, palpably an overstatement, whereas the effects of the final episode in the active use of the castle cannot be gainsaid. 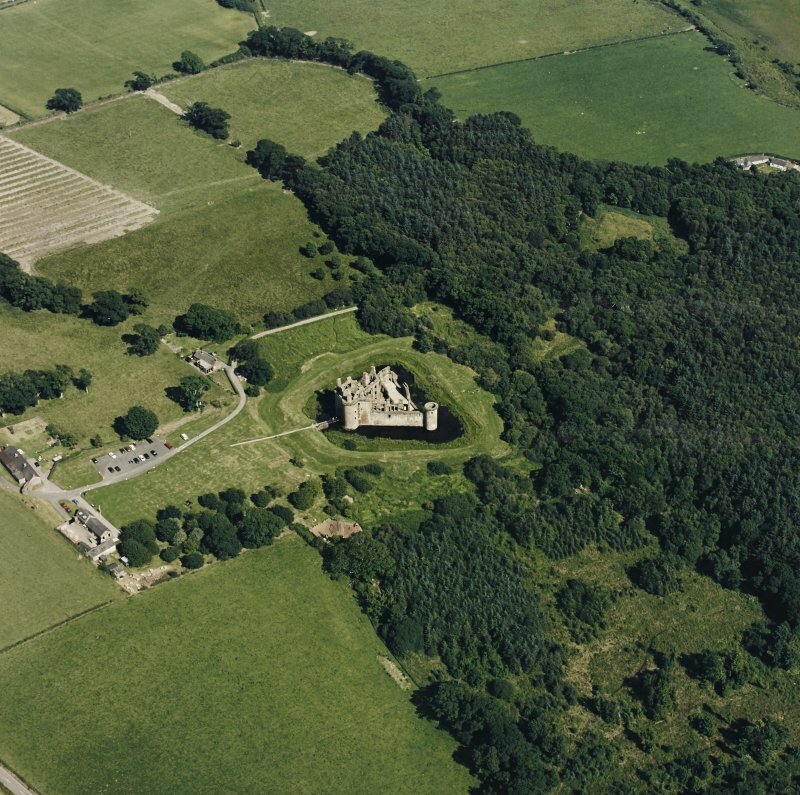 In 1640 a Royalist garrison under Robert Maxwell, 1st Lord Nithsdale, capitulated after a 13-week siege and bombardment by an army of the Estates, the castle thereafter being partly dismantled to prevent its further occupation. The vigorous history of this frontier castle satisfyingly bears out its martial appearance, but it was a residence as well as a stronghold. 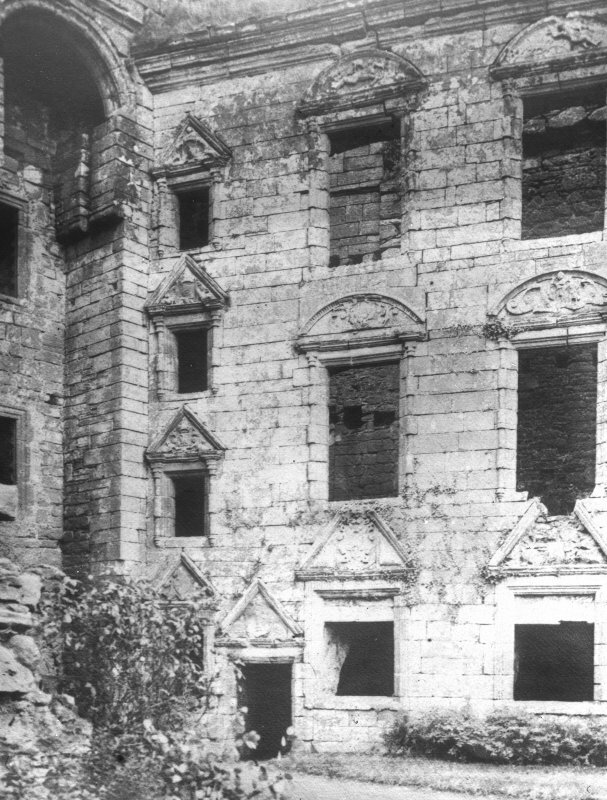 Originally the main hall was on the first floor of the gatehouse block, but was later sub-divided. 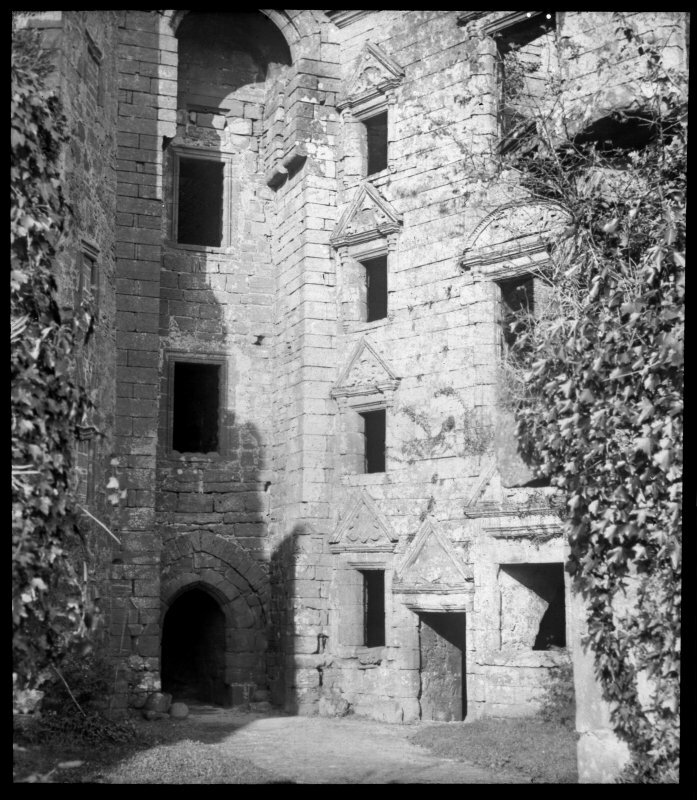 The 15th century range on the western side of the courtyard contains a series of chambers, probably for guest accommodation. 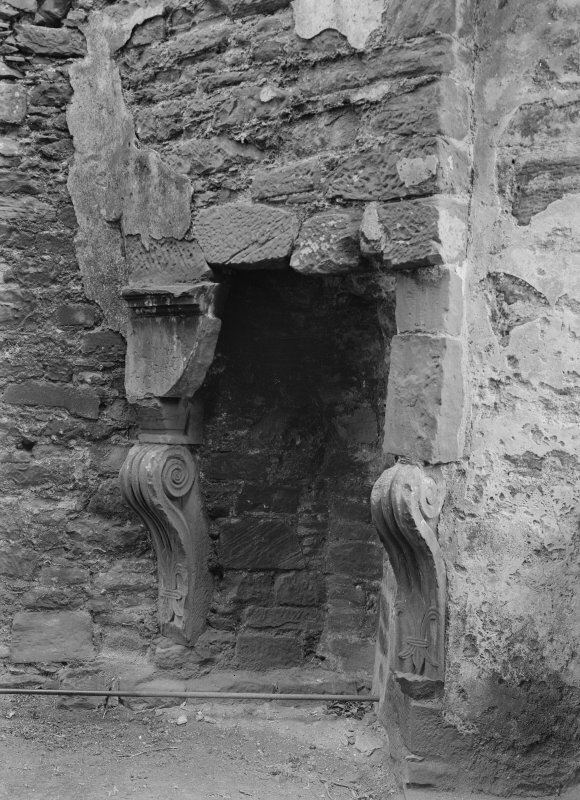 Little survives of the hall block built along the inside of the south curtain in the 1630s, although its doorway gives some idea of its former grandeur. 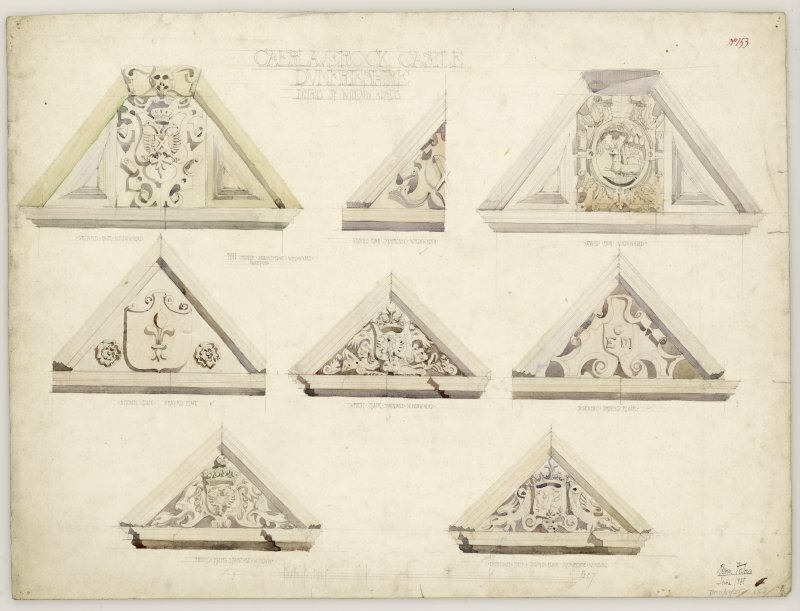 The three-storeyed east range, Nithsdale's building (1634), had a symmetrical six-bay ashlar facade, of which four bays survive intact; the openings have moulded surrounds and carved pediments bearing armorials and relief sculptures. 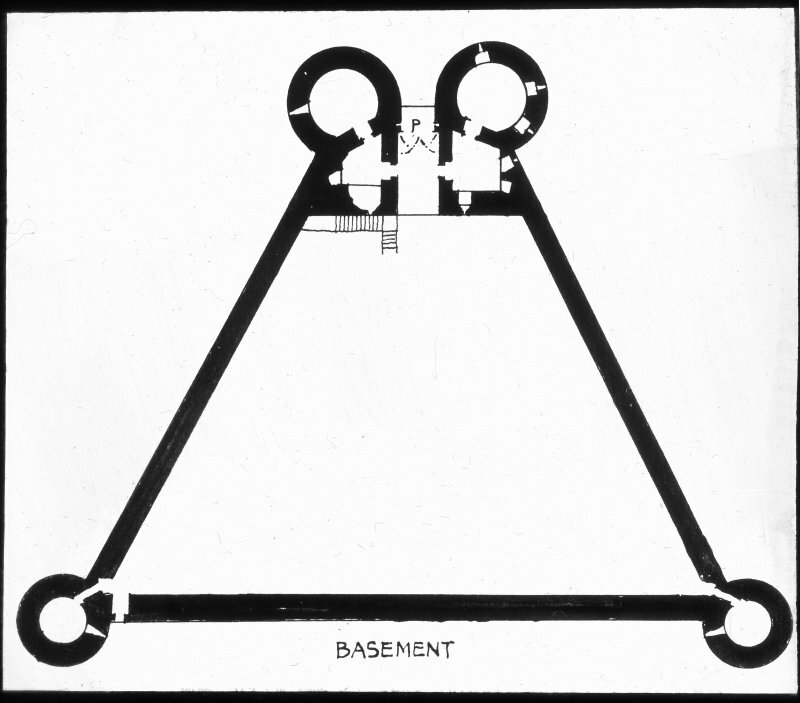 The service basement, which incorporates the castle well, is of early origin; the upper floors were served by a spacious staircase, and most rooms were well equipped with windows, latrines, and fireplaces. The splendours of Caerlaverock divert attention from the peculiarity of its low-lying setting, close to the edge of woodland swamps and overlooked from the north. An English report of 1563-6 was sceptical of its capabilities 'unless the hill above the same, called the Ward Law, be fortified . . :. However, it had some advantages insofar as 'boats ... often tons will come to the foot of this hill at the full sea'. 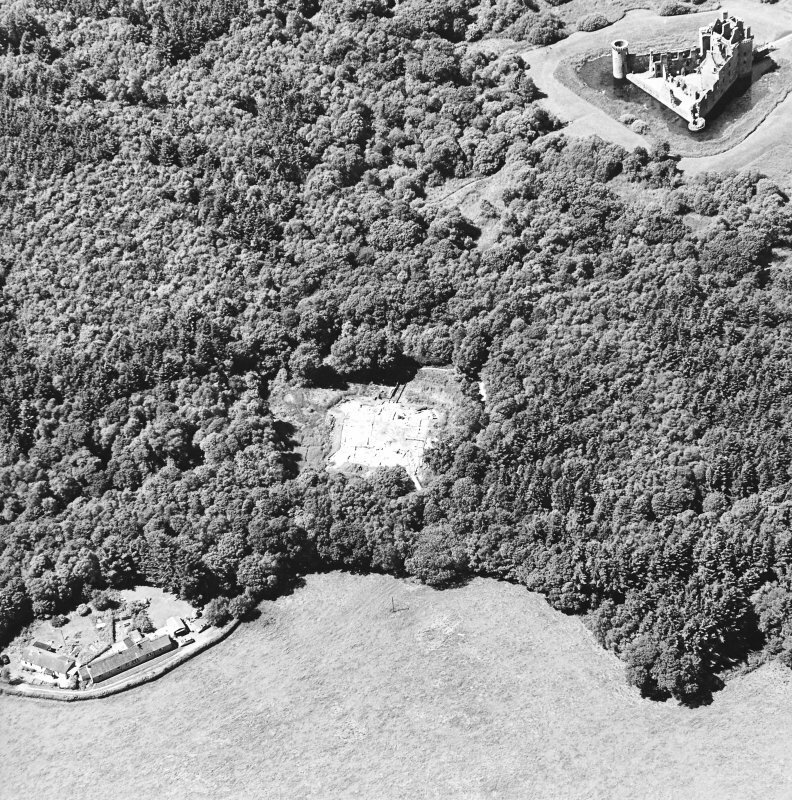 Among the trees and swamps some 180m to the south of the castle is one of the great unsolved mysteries of Caerlaverock: a large, oblong, and formerly moated platform which has revealed traces of medieval masonry (NX 027656). 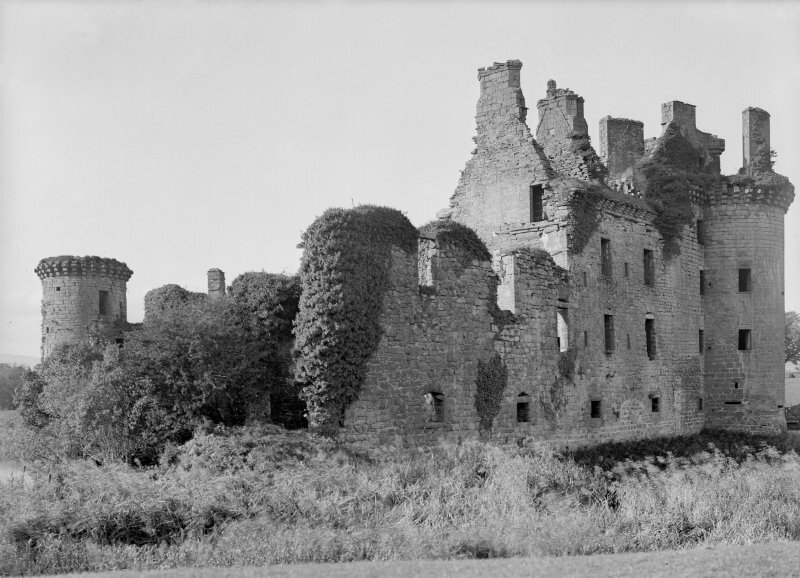 It may have been a temporary substitute for the existing castle during an alleged phase of dereliction in the 14th century, or a 'failed' 13th century precursor, or even a near-contemporary bridge-head or supply depot. 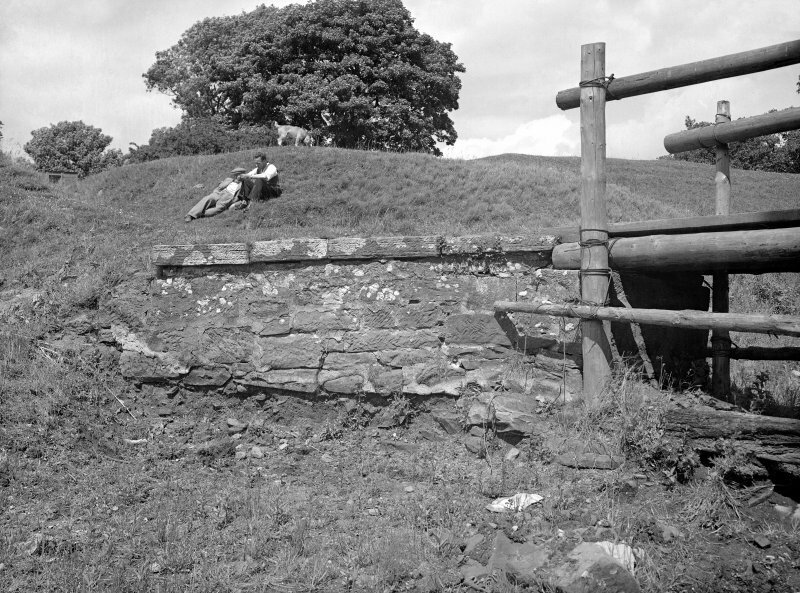 Immediately after the fall of Caerlaverock in 1300, Edward I reconstructed the peel at Dumfries on a large scale, involving the import and trans-shipment of much Cumbrian timber; it is possible that this structure at Caerlaverock may also belong to the English period between 1300 and 1312. 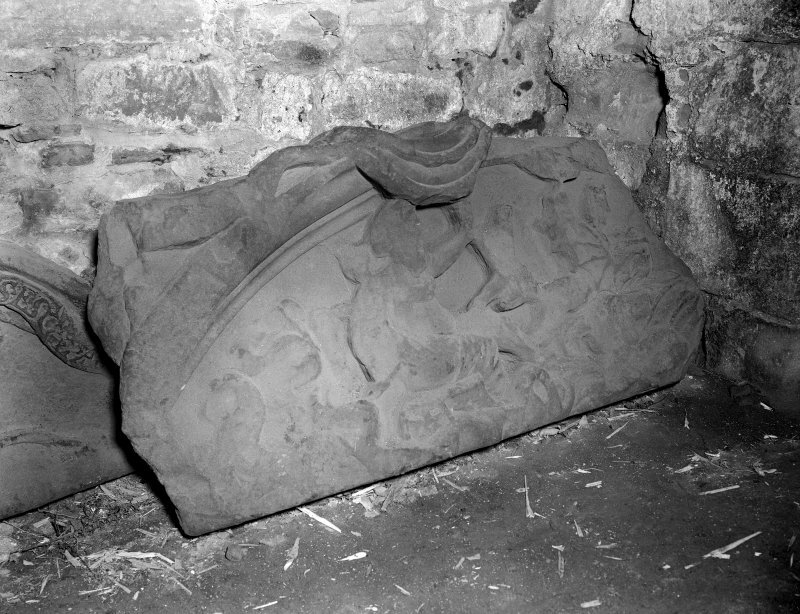 Kirkdale Archaeology Ltd, under contract with Historic Scotland, were commissioned to retrieve for dating purposes certain pieces of timber uncovered in previous excavations. 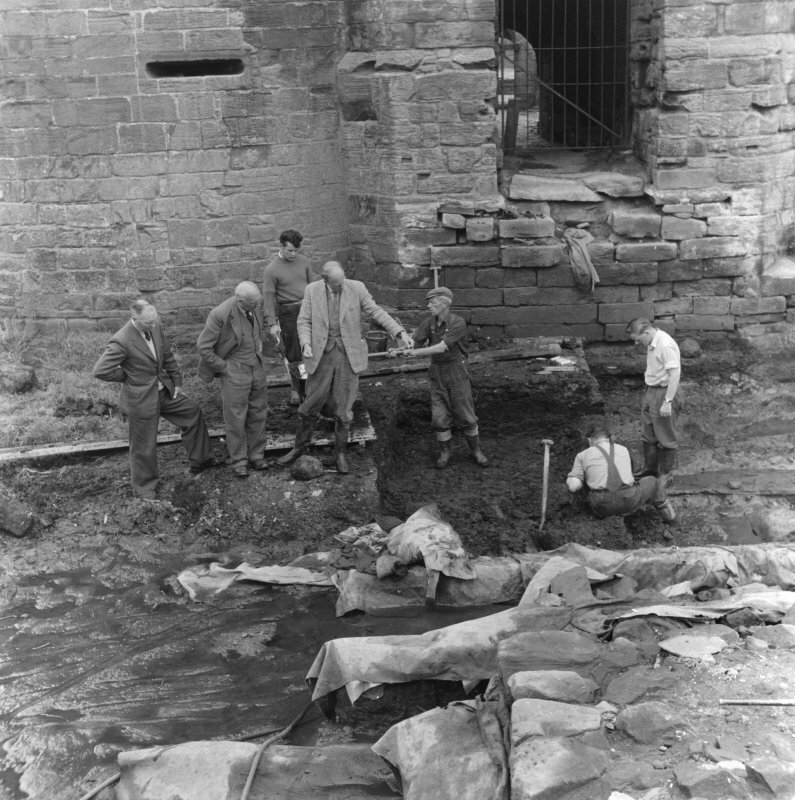 The wood was to be taken, if possible, from 2 places, the first being a box-like structure or sump lined with planks discovered during the 1959 excavations (pit 3) in the moat at the junction between the S curtain wall and the SE tower. 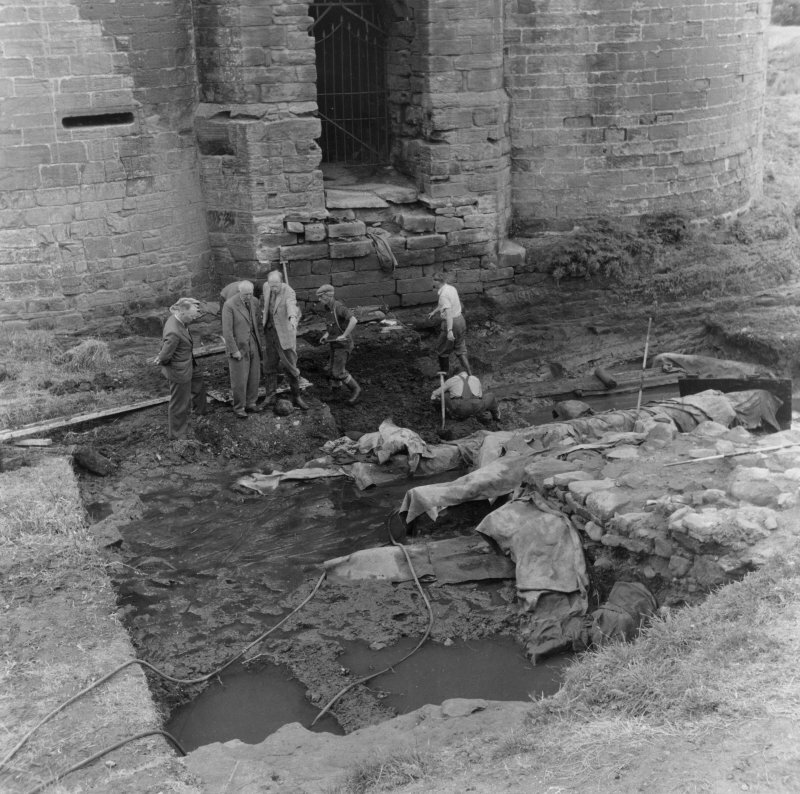 The other timber was to be retrieved from the remnants of a wooden bridge across the outer “dry” moat, excavated in 1966. 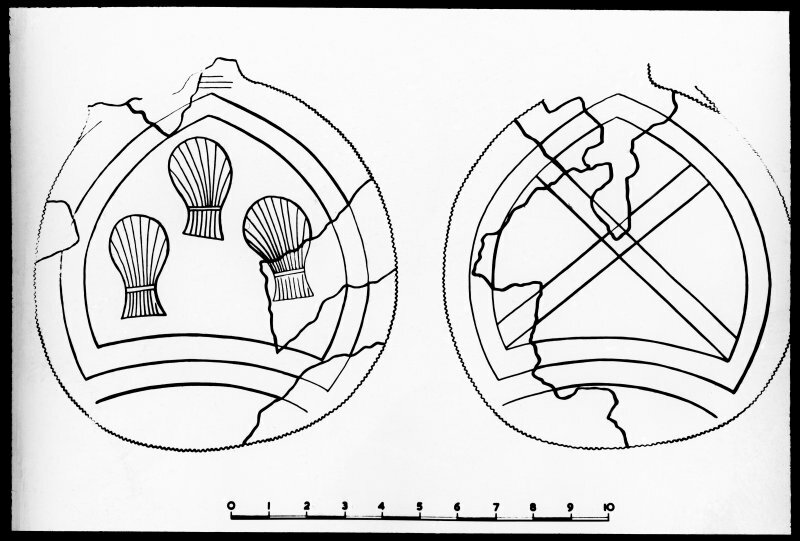 The work was carried out on the 19th and 20th November 1996 and recorded using photography, notes and a location plan imposed on a copy of the location plan for the previous excavations. 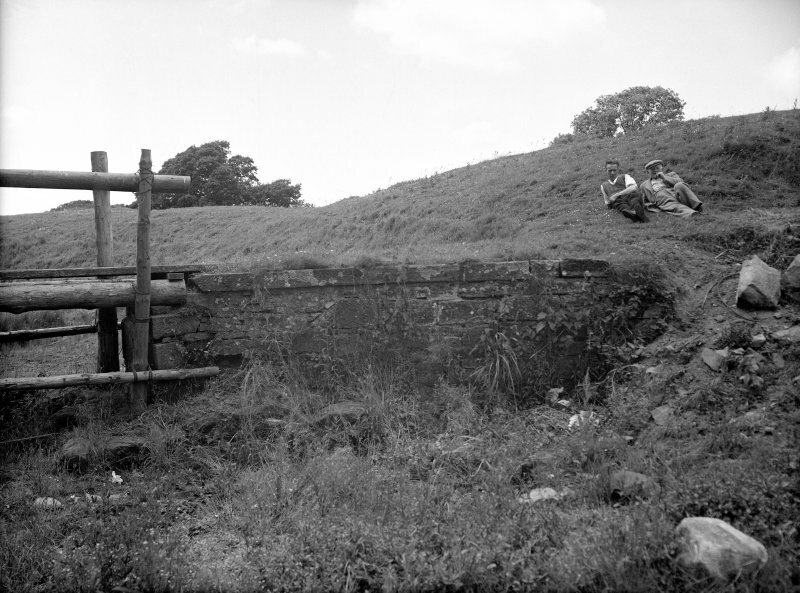 Excavation of a trial pit prior to the creation of a soakaway was monitored in October 1999. The trial pit was located in the W corner of the field to the E of the Guardianship area, and was up to 2.5m in depth. 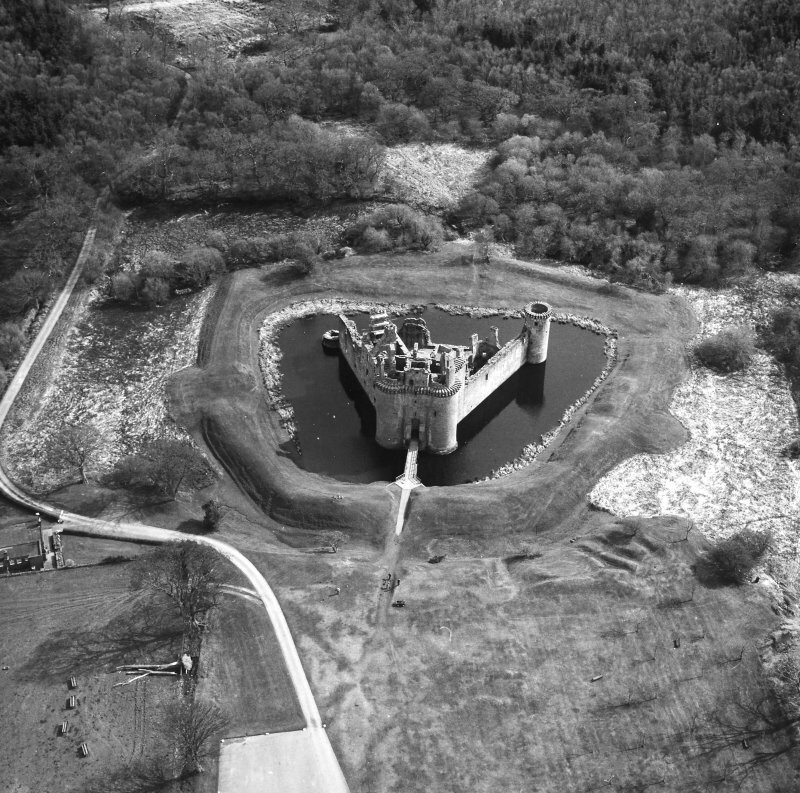 A programme of drainage improvements was carried out in late February 2000 at Caerlaverock Castle, Dumfriesshire, in order to counteract the constant flooding of the castle car park. These works involved the machine-excavation of a trench 58m long with a depth ranging from 300-950mm. 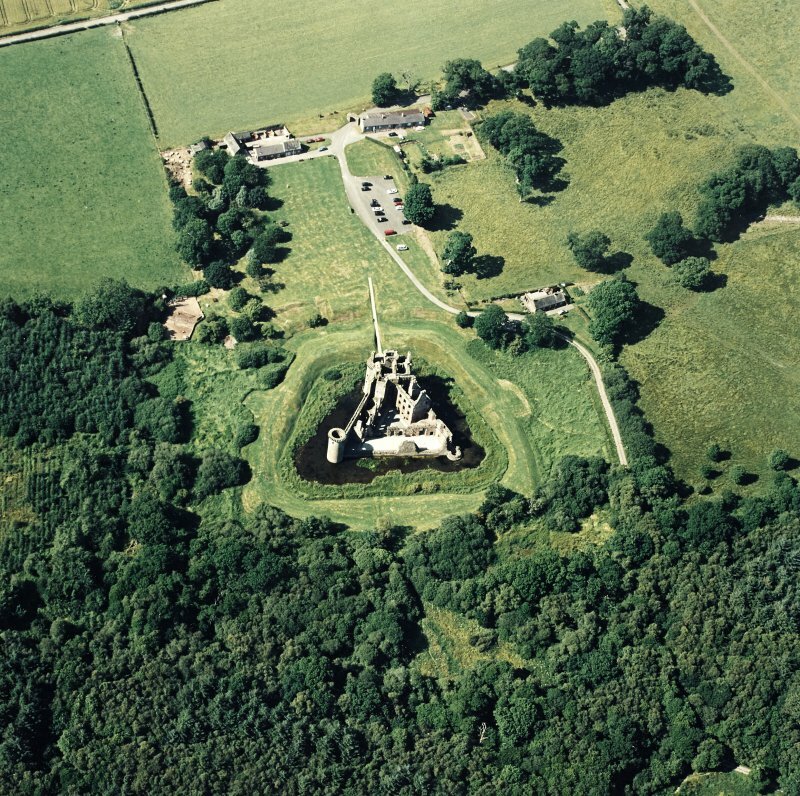 A watching brief was conducted in September 2000 during the excavation of two test pits for soakaway holes in a field to the NW of Caerlaverock Castle, Dumfries and Galloway (NGR NY 025 656). Nothing of archaeological significance was disturbed. NY 024 657 Archaeological monitoring was undertaken on 21 November 2006 during the excavation of a trench near the visitor centre as part of works to replace an existing underground electricity cable. The works caused no disturbance to any previously undisturbed ground, and the trench ran through an area of much recent disturbance and landscaping. There were no finds or features of archaeological significance. NY 025 656 Archaeological monitoring was undertaken between 16-26 October 2006 while sub-contractors undertook the excavation of two soakaways and two drainage channels alongside the current road and SE car parks. An additional day of monitoring was required during the removal of the road's subbase over a 56.4m section. During these works a field drain and wall were partially revealed. Neither feature was thought to be earlier than 18th-century in date. NY 0254 6563 This small collection of late and post-medieval stones, mostly in the striking red sandstone of the area, was assessed during December 2007–January 2008. It contains a number of impressive carvings. 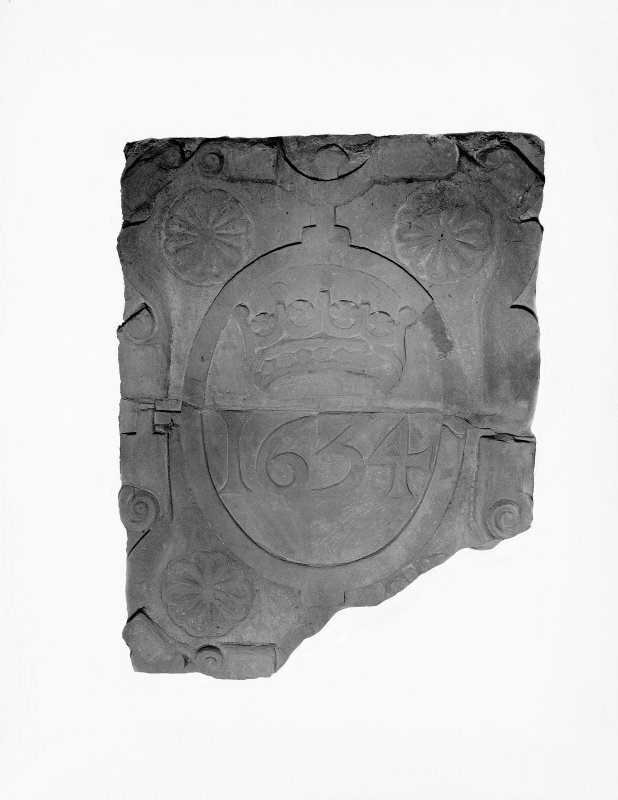 Many of the stones are substantial and include window pediments and heraldic panels. 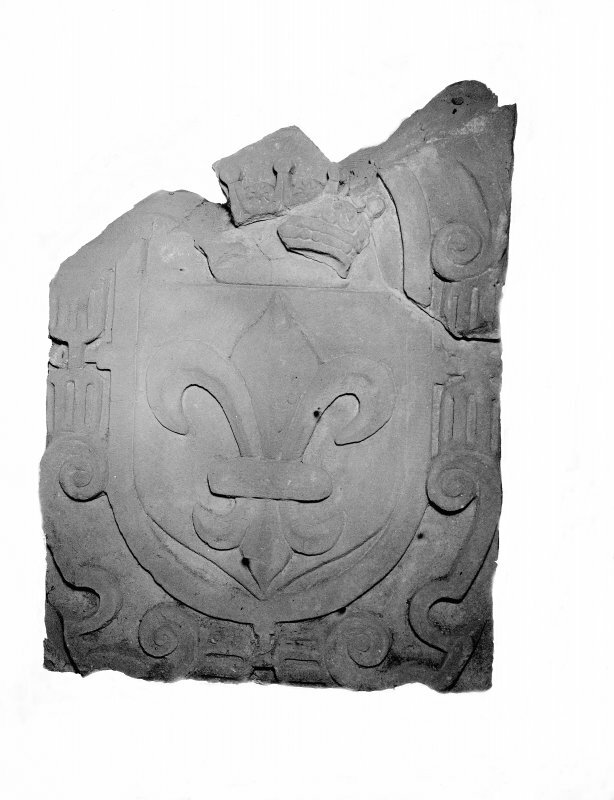 A fine example of Maxwell heraldry is on display in the castle’s museum. 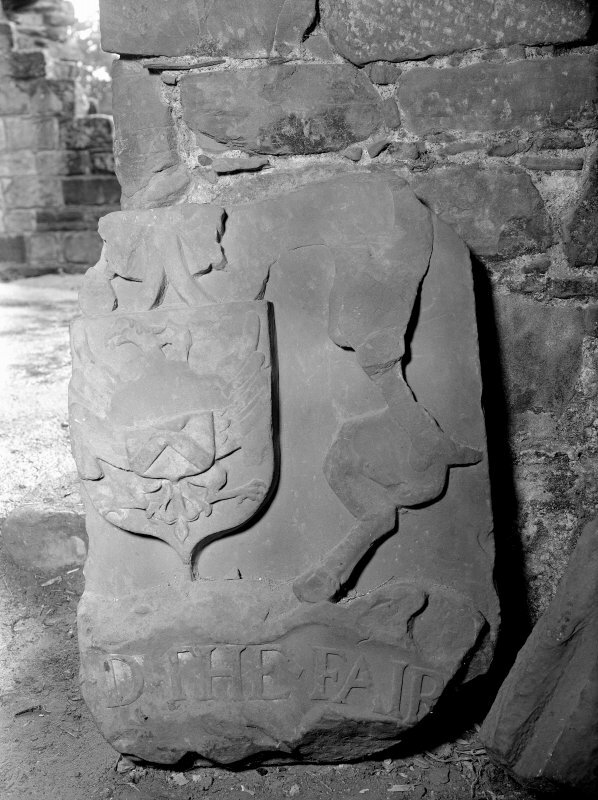 It shows a two-headed eagle with outstretched wings, and a small shield with a saltire. 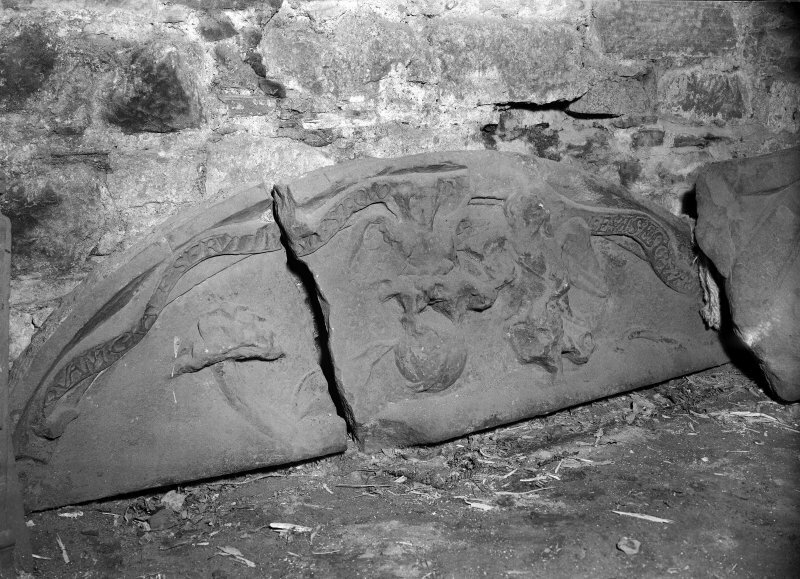 The damaged feature on the right-hand side of the shield is a stag, and one cloven hoof is still clearly visible. Another striking piece is the large gargoyle on display in the visitor tea room. The grimacing face is shown with lines around the eyes, nose and mouth, emphasizing the expression, and the teeth, Adam’s apple and wispy beard are given detailed treatment. The lack of weathering on the stone indicates that it originally came from an indoor location, for example the W range. 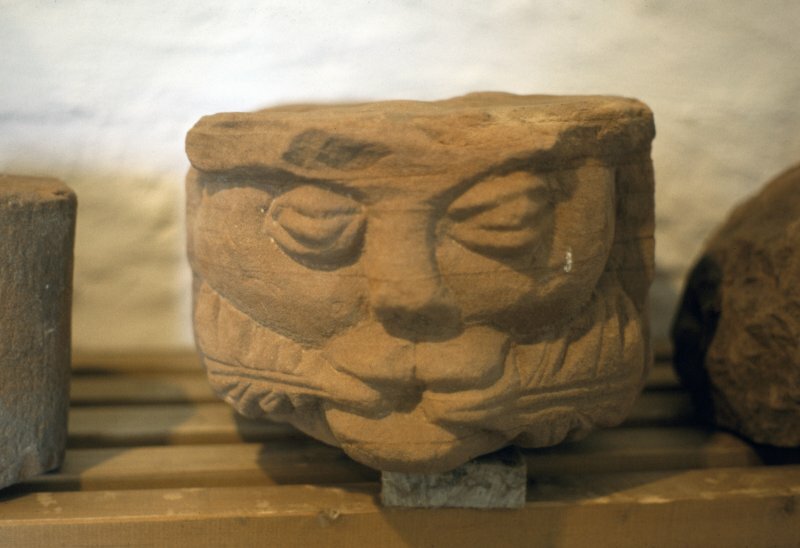 This and other inventories of carved stones at Historic Scotland’s properties in care are held by Historic Scotland’s Collections Unit. For further information go to: hs.collections@scotland.gsi.gov.uk. NY 025 656 The hand excavation of an electricity cable trench was undertaken from 7 April–8 May 2008 in the grounds of the castle. A total of 285m was excavated of which c140m was inside the scheduled area. A small section of post-medieval wall was uncovered near the current Greenhead Cottages. The wall, which was two courses high, was constructed directly on top of the natural bedrock, which had been cut to form terrace-like steps. A probable return was located but it appeared the stone here had been robbed away. This robbed-out return also appeared to be the terminus of the wall, but the narrowness of the trench prevented any further to investigation. Although the main wall appeared to be running to the south-eastern corner of the existing cottages it was on a slightly more northerly alignment than the cottage wall. The finds from the fill of the cut for the wall indicate a later postmedieval date. 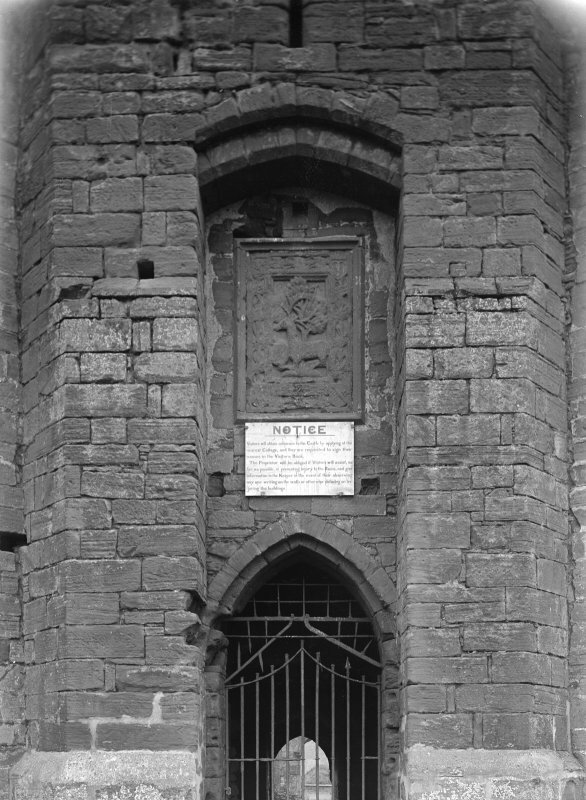 A lead cannonball was recovered from a layer just to the SW of the current stone gate. It measured 45mm in diameter and weighed 630g. Several sherds of medieval pottery were recovered from the trench along with a silver George III half crown dating to 1819. NY 025 658 A watching brief was carried out on 18 March 2009 during the excavation of six small and four larger test pits in the field to the N of the visitor centre. 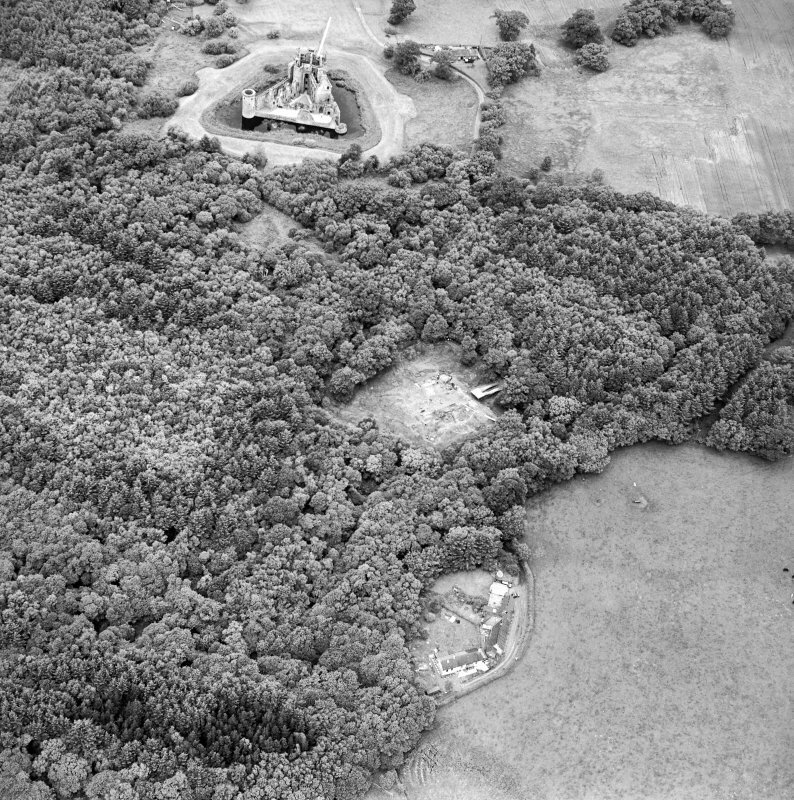 The pits were positioned to avoid possible features identified during a previous geophysical survey. Deposits of uncertain date containing a fragment of modern china and a chert flake lay between the plough soil and the underlying natural. As the plough soil did not reach the subsoil archaeological features may survive beneath this modern horizon. The chert flake, although probably redeposited is a reminder of the potential for early sites along a relic coastline. NY 0248 6576, NY 0252 6570 and NY 0253 6566 A watching brief was maintained 15–17 November 2010 during the excavation of three small trenches that were dug in order to locate a fault in a power cable. Only one trench revealed any deposits of archaeological interest (NY 0253 6566). These deposits included possible construction debris, an earlier ground surface and gravel layers, which may have related to the excavation and re-deposition of natural deposits during the construction of the castle moat. NY 0244 6583 (centred on) A series of trenches was excavated 28 March–7 April 2011 in a field to the N of the visitor centre to assess the potential impact of a new car park. The trench locations were guided by an earlier geophysical survey. In addition to a modern service trench, a number of archaeological features were recorded. 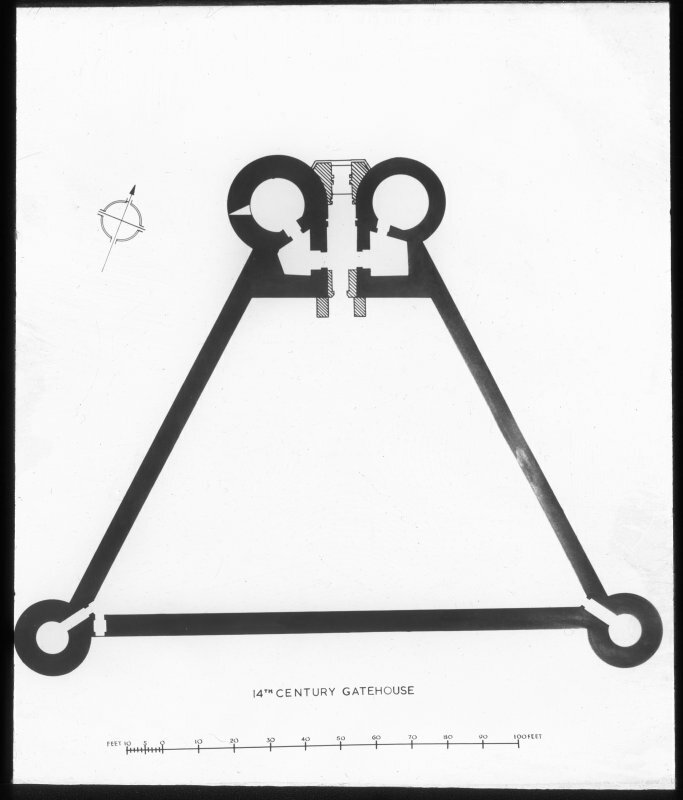 These consisted of a combination of linear slots and ditch-like features plus a series of discrete pits of various sizes. Archaeological features were located in all of the trenches. Only one of these features was fully excavated, the rest being revealed after the machine removal of topsoil. The features revealed towards the S edge of the site were generally more extensive and better preserved than those towards the N of the site, where the plough soil was shallower. The features are thought to mainly represent prehistoric activity across the whole site. A ditch and pit complex, noted in Trench 9, was partly excavated and prehistoric pottery was retrieved from the pit, with part of an edge of pottery also recorded in the ditch. The upper fill of the southern of two ditches in Trench 5 was partly excavated, exposing an underlying stone-rich fill.